After massive corruption and billions of rubles wasted progress is being made. Other facilities at Vostochny is key to their manned programs evolution away from Soyuz stack to the PTK NP spacecraft & Angara 5. For decades, Soviet soldiers and officers and later their Russian civilian successors had to brave winter cold and summer heat preparing Soyuz rockets for launch on open-air gantries in Baikonur and Plesetsk. 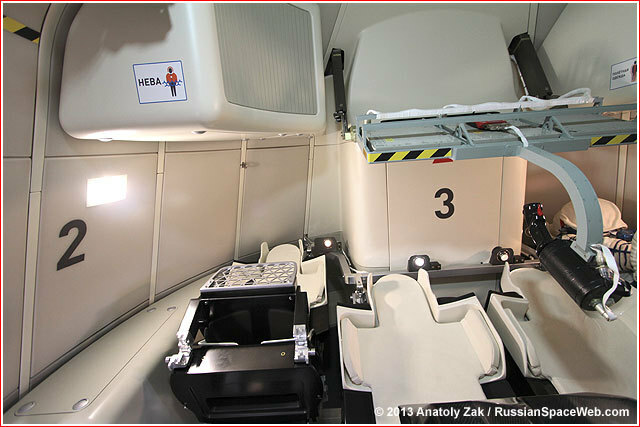 But in a sign how times have changed, the new generation of rocketeers will be protected from snow and rain with a climate-controlled tower completely enclosing the Soyuz rocket before liftoff from its newest launch pad at Russia's Vostochny Cosmodrome. Following the delivery of the Soyuz rocket to the launch pad, the Service Cabin, KO (a Russian abbreviation for "Kabina Obslyzhnivaniya"), moves into position around the wide base of the rocket under the launch pad. A series of access bridges then are deployed and raised vertically to form a three-level scaffolding just inches from the vehicle. 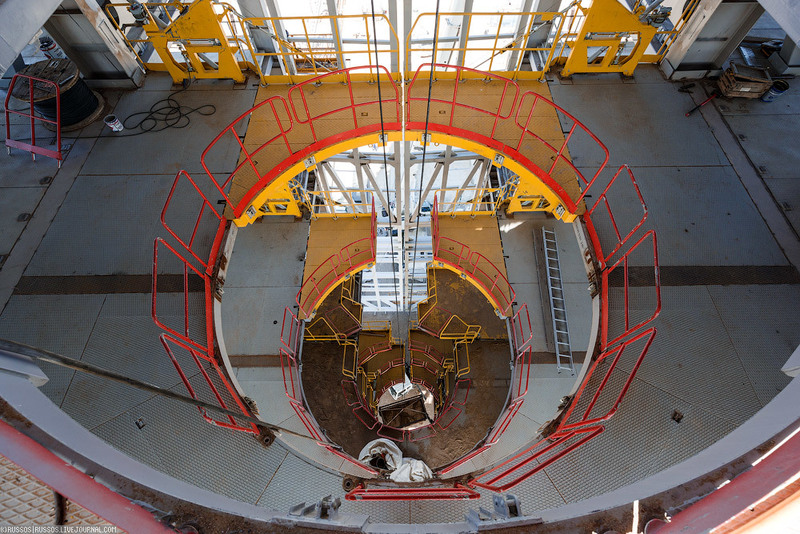 The bridges provide access for the launch personnel to the first and second stage of the rocket at three levels, all located below the main concrete surface of the launch pad. 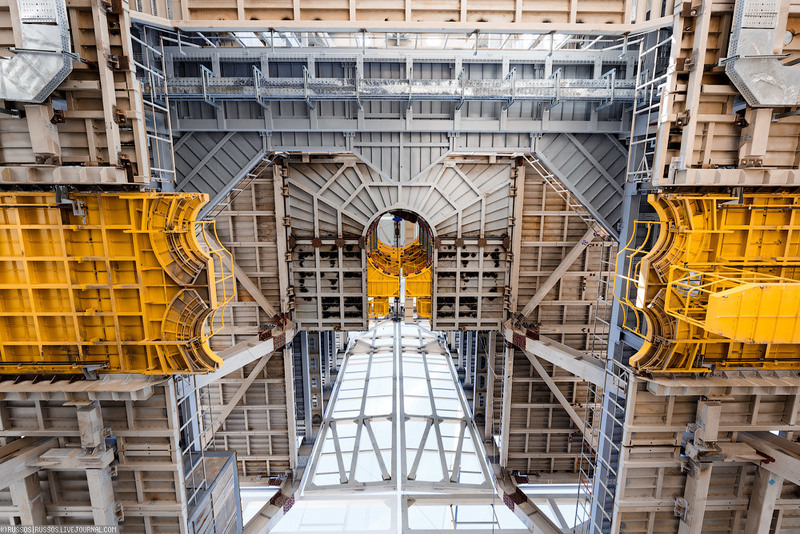 The structure is used by fueling personnel to connect kerosene and liquid oxygen supply lines from the launch complex propellant storage to the multiple propellant tanks onboard the rocket. 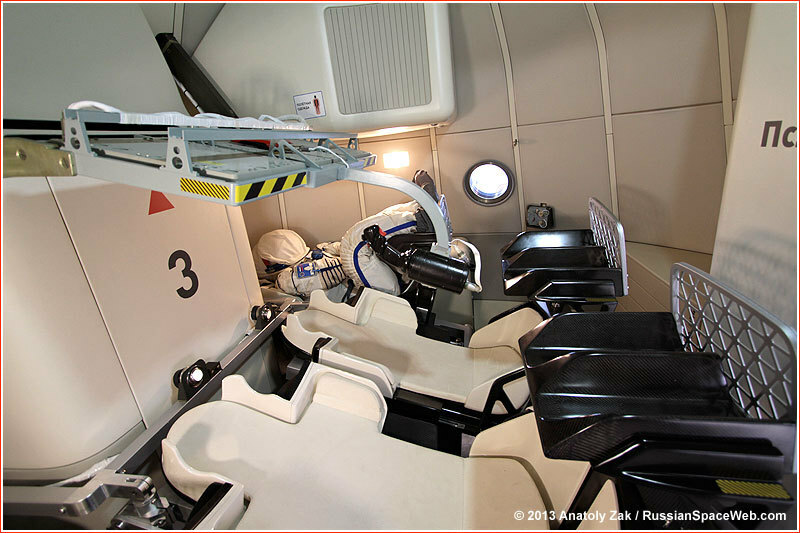 First built in 1956, the movable Service Cabin is common for all Soyuz pads in Baikonur, Plesetsk, Kourou and Vostochny. 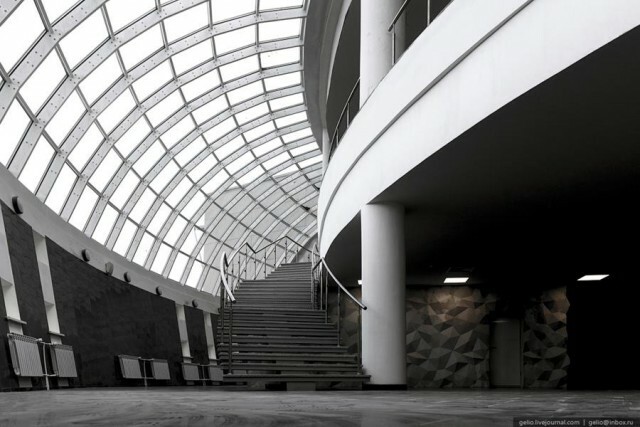 The original structure, designated 8U216, was developed at the TsKBTM design bureau in Moscow and manufactured at the Novokramatorsk Machine-building Plant, NKMZ, in Ukraine. 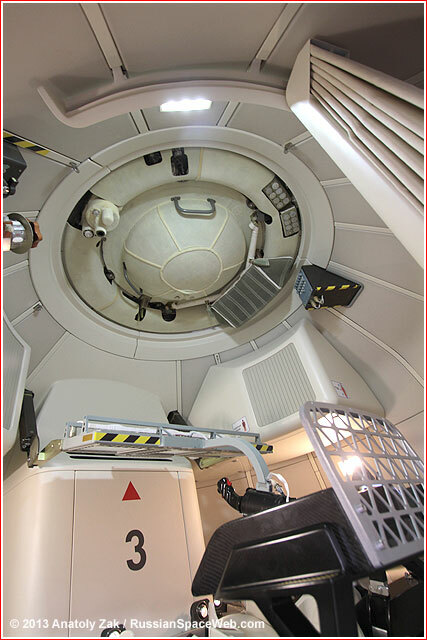 In the original Service Cabin, all access bridges formed a circular turntable, which could rotate along with other service systems to orient the rocket for a correct ascent azimuth depending on the orbital inclination of the upcoming mission. This feature became unnecessary with the introduction of the Soyuz-2 variant, whose flight control system could perform the necessary roll maneuver in flight to attain the correct azimuth. Shortly before liftoff, the access bridges of the structure are folded and it moves on rails into a large niche below the pad. A special vertical shield protects the structure from the exhaust of the rocket at launch. Very impressive, hopefully this leads to more international co-operation. Excellent-looking facility. Hope they get all the trouble worked out and get it finished without further delay. They need that place up and running. Russia's new Vostochny Cosmodrome has booked its first high-profile commercial satellite launches as part of a contract worth more than $1 billion between Russian space agency Roscosmos and French and British space companies, news agency TASS reported Friday. 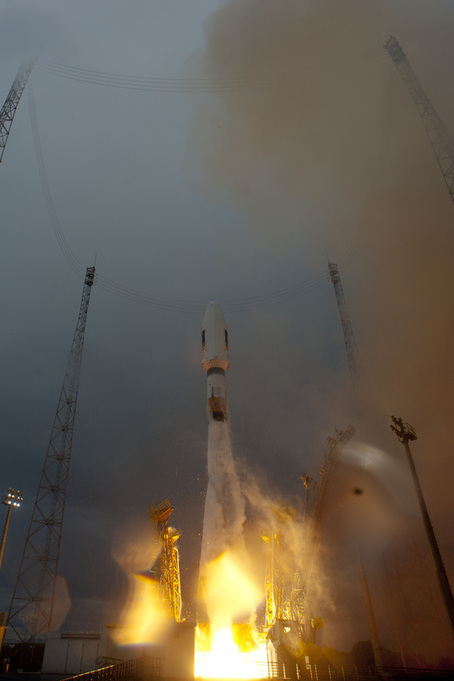 French space launch provider Arianespace on Thursday announced it would purchase 21 Russian-built Soyuz rockets to launch between 650 and 720 microsatellites built by British firm OneWeb. The satellites will provide Internet services to all corners of the globe. The news is a major boost to Russia's space industry, which has suffered a series of embarrassing launch failures in recent years. The contract is the largest in commercial space history, valued at $1-2 billion, according to SpaceNews. The first batch of 10 pilot satellites will be launched on a Soyuz rocket in late 2017. The remaining 20 launches will take place over 2017-19 and carry between 32 and 36 satellites each, SpaceNews reported Thursday. Some of the rockets will take off from Russia's $3 billion Vostochny Cosmodrome, which is under construction in the country's Far East, a Roscosmos spokesman was quoted by TASS as saying Friday. The exact number of launches from Vostochny was not specified in the report. Arianespace CEO Stephane Israel was quoted by SpaceNews on Thursday as saying that 15 of the launches would take place at Roscosmos' current primary launch facility — the Soviet-built Baikonur Cosmodrome in Kazakhstan — beginning in 2017. OneWeb's project will make use of Vostochny and other Soyuz launch facilities around the world, such as Russia's northern Plesetsk Cosmodrome and a Soyuz launchpad at the European Space Agency's spaceport in South America, according to Arianespace and Roscosmos. Every year, Baikonur space launches bring Russia the profit of $1.5 billion. Russia rents the space complex for $115 million a year. Therefore, the construction of the Russian cosmodrome known as Vostochny (Eastern) came as unpleasant news to Kazakhstan. "Taking into account an opportunity for Russia to build its own cosmodromes before 2050, the development of international space services will be a decisive factor in maintaining the Baikonur cosmodrome. It is now when we must think how to maintain Baikonur should federal programs leave the complex," the chairman of the National Space Agency of Kazakhstan Talgat Musabaev said back in 2011, Tengrinews.kz said. However, in the current situation, when economic relations between Russia and Kazakhstan have become even closer with the help of their membership in the Eurasian Economic Union, it is not beneficial for Russia to cut ties with Kazakhstan and shelve Baikonur programs. Officials with the Russian Federal Space Agency Roscosmos said that the Vostochny cosmodrome is not going to be a competitor to Baikonur. "The creation of the Eastern cosmodrome will increase the number of space launches for both the national economy and space exploration. Thus, Baikonur and Vostochny cosmodromes will cooperate closely to achieve the tasks," the press service of Roscosmos told Pravda.Ru. It is important to understand that for Russia, Vostochny cosmodrome is not just an economically important project. It also has a social significance. The new spaceport is being built in the Amur region of Russia, near the closed town of Uglegorsk. The economic development of the region thus depends on the project. "In the first place, the new spaceport will ensure Russia's independence in the space industry. In addition, the spaceport has a favorable geographical position that will enable both manned flights and launches for economic and scientific purposes. The development of the Far East is also highly important. 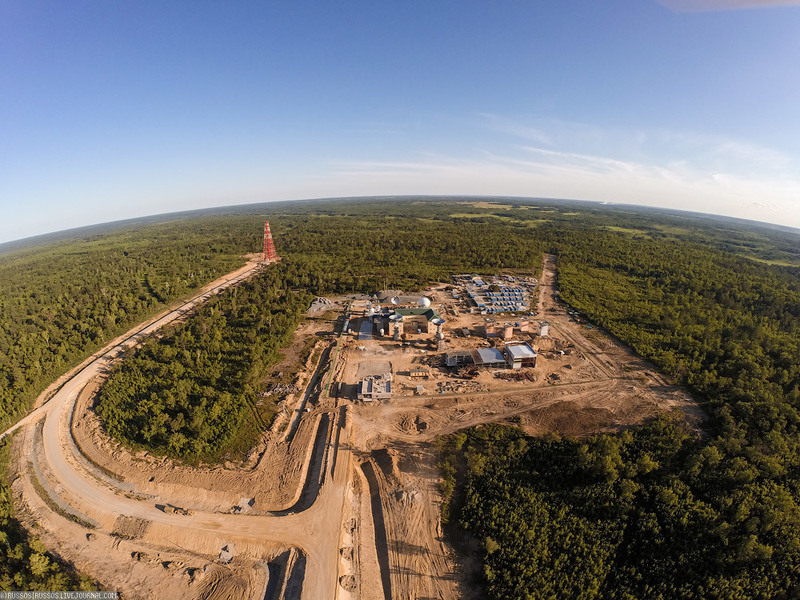 The cosmodrome will be a key factor that will attract young professionals to the region. 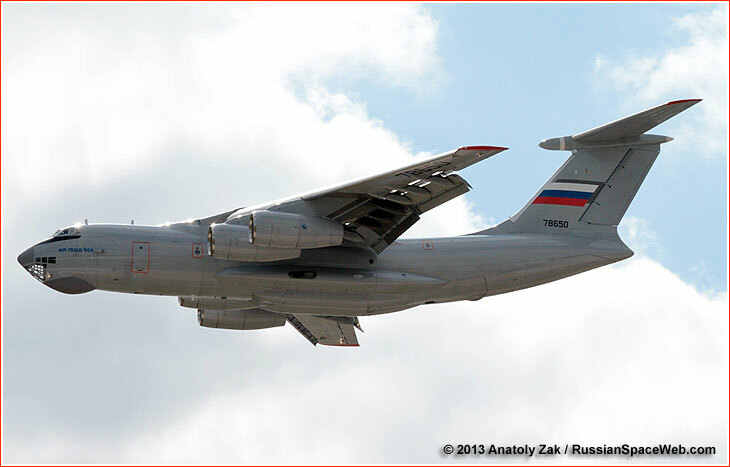 It will create powerful production and transport clusters," the press service of Roscosmos said. The first rocket is to blast off from the new Russian spaceport in the Far East already in December 2015. The first manned space flight is scheduled for 2018. "The construction of the cosmodrome in the Far East is a state instrument of the Far East. In fact, it is not very important when rockets fly into space. The number of new jobs is a lot more important, Andrei Ionin, a member of the Russian Academy of Space Science told Pravda.Ru. "I have never contraposed Baikonur and Vostochny cosmodromes. I have always thought that they need to develop both. 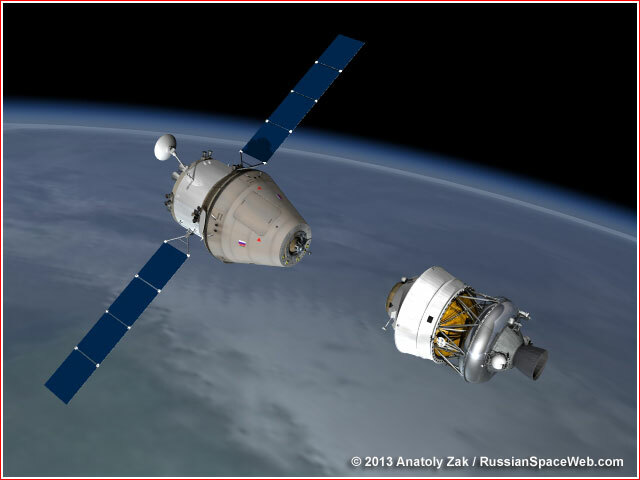 Russia, Kazakhstan and other Central Asian countries can already develop joint space projects. In the Far East, the new spaceport should immediately become an international complex," Andrei Ionin told Pravda.Ru. If Russia wants to go East, Russia should look for strategic partners in the Asian region, where there are a lot of countries that want to develop space projects. They are not only China and Japan, but also South Korea, Indonesia, Malaysia, Vietnam etc. Therefore, the Vostochny cosmodrome will be not just a Russian, but an international spaceport on the Russian territory, the expert concluded. KHABAROVSK, August 7. /TASS/. 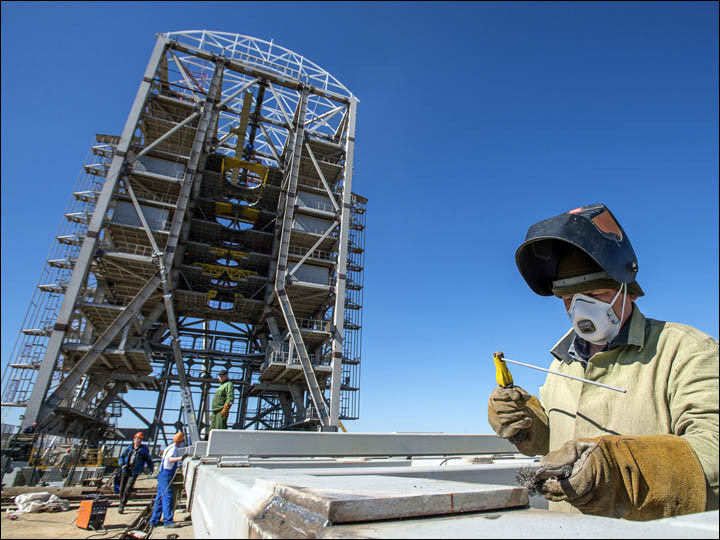 Facilities at the Vostochny cosmodrome are ready by 95%, head of the Dalspecstroy contracting company Yuri Volkodav said on Friday. 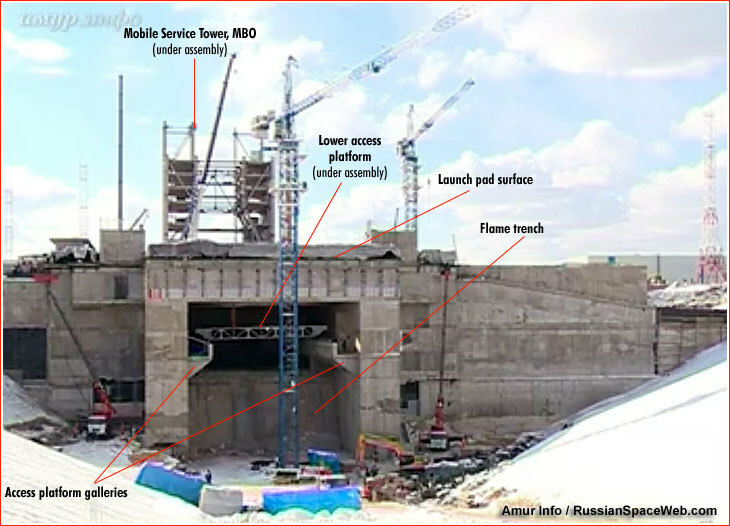 The first launch from the new cosmodrome is scheduled for this year, and the construction should be over by November 30. 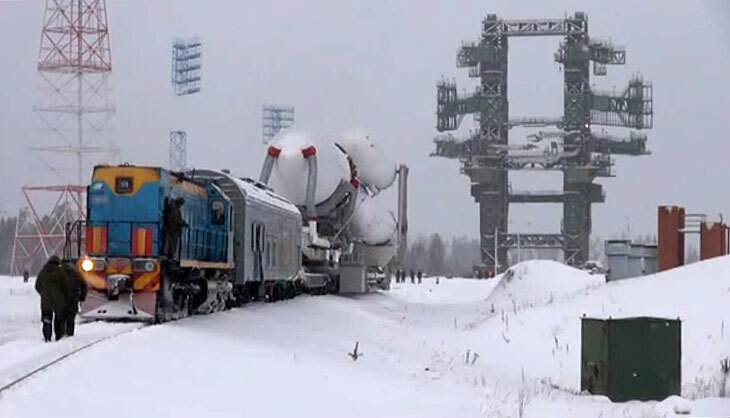 "All contracts under the ‘launch minimum’ have been fulfilled," he said, explaining the ‘launch minimum, without which the cosmodrome cannot be working, is nine contracts, including a railway, a car road, a start and technical facilities, security and energy supplies. 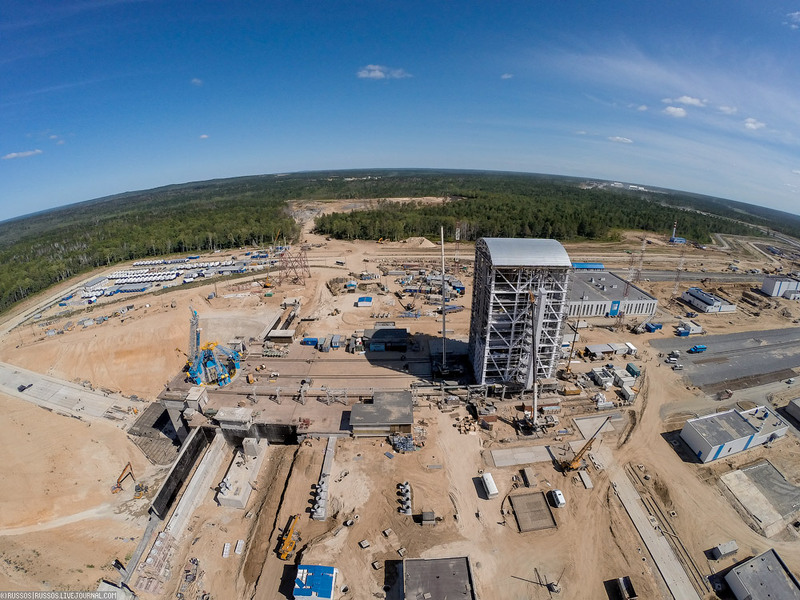 The Vostochny cosmodrome will have two launch platforms, an airfield, facilities for crew members’ pre-launch preparation, oxygen-nitrogen and hydrogen plants, 115 kilometers of roadway and 125 kilometers of rail track. Vostochny will be Russia’s first national civilian cosmodrome to ensure the country’s full access to outer space. KUBINKA (Moscow region), June 17. /TASS/. 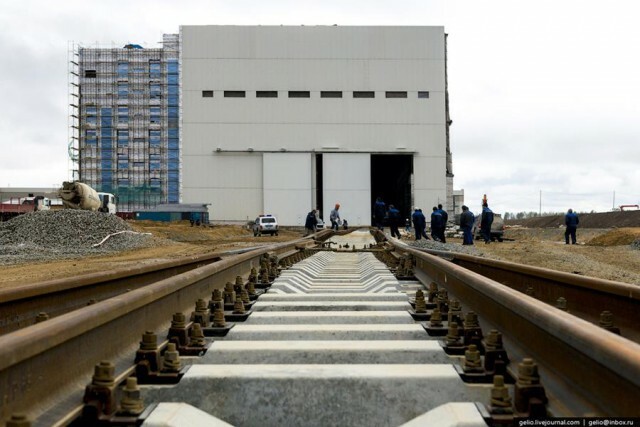 There are no plans to create military launch facilities at the Vostochny cosmodrome that is currently under construction in the Russian Far East. Military personnel will be attracted only for Defense Ministry’s satellite launches, head of the Mozhaisky Military Space Academy Major General Maxim Penkov told TASS on Wednesday. 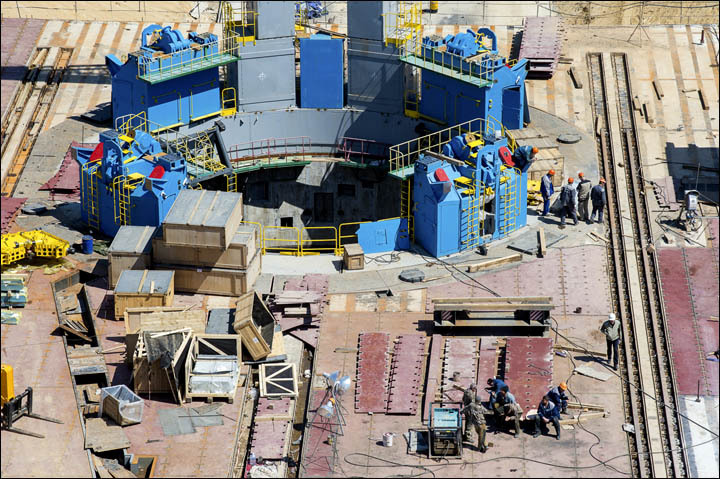 "The Vostochny cosmodrome is being built within the framework of programmes of the Federal Space Agency (Roscosmos). No military launch facilities are planned to be placed there," Penkov said at the Army 2015 Forum currently underway in Moscow, when asked whether the Academy graduates will serve at the spaceport. According to Penkov, "military specialists will be attracted for launching military spacecraft from Vostochny, although the operating personnel will be generally civilian." "We’ll not train military specialists for the Vostochny cosmodrome," he said. 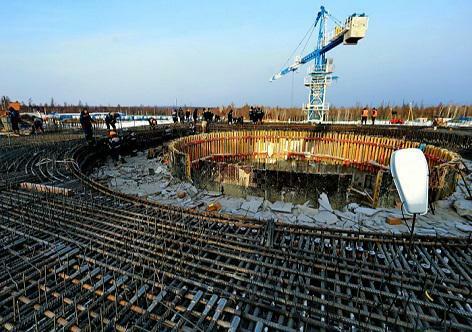 The first launch from the Vostochny spaceport is planned to be carried out in late 2015. Russian President Vladimir Putin said previously that the creation of the new spaceport Vostochny in the Far East should confirm Russia’s high scientific and technological status. In his opinion, the new spaceport should become "yet another strongpoint for the development of our Far East." 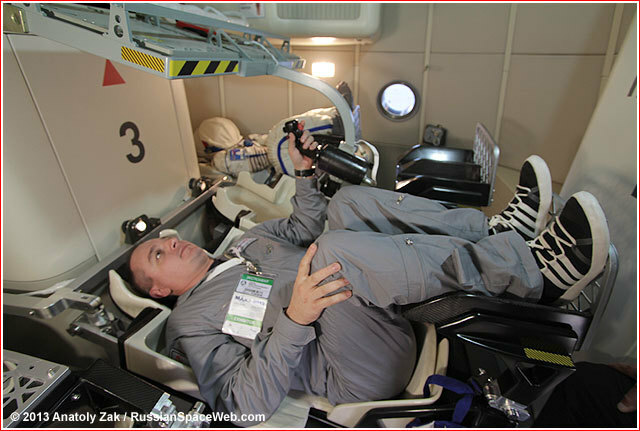 Vostochny should become operational in 2015 and start sending manned missions in 2018. The comsodrome is intended for launching automatic and piloted space missions under national, international and commercial programmes. Its construction started in 2012. By 2018, it will be ready to launch heavy Angara-5A rockets. The cosmodrome will also have infrastructure for future piloted missions. The Vostochny cosmodrome is being built near the Uglegorsk town in the Amur region that will soon get the name of Konstantin Tsiolkovsky. The complex will include two launch facilities, an aerodrome, cosmonauts’ flight training facilities, an oxygen-nitrogen plant and hydrogen plant, 115 kilometres of automobile roads and 125 kilometres of railways and other facilities. The first rocket to be launched from Vostochny is to be the Soyuz-2.1a, made by the Progress Rocket and Space Centre. 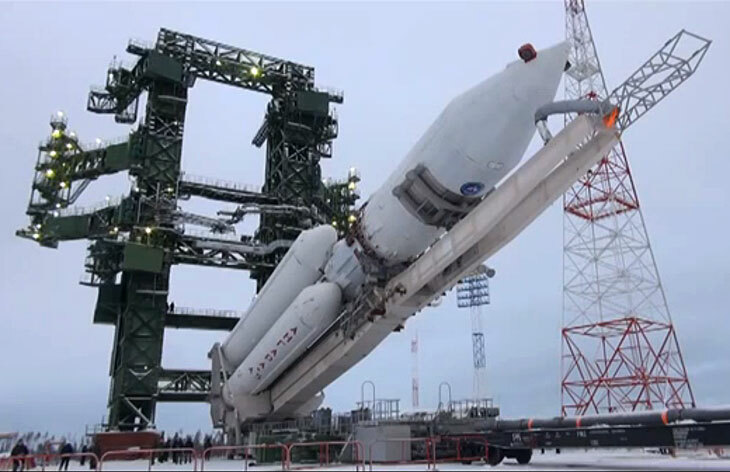 The carrier rocket will place into orbit the Samara satellite Aist-2, the SamSat-218 nanosatellite of the Samara State Aerospace University and the Lomonosov satellite of Moscow State University (MGU). 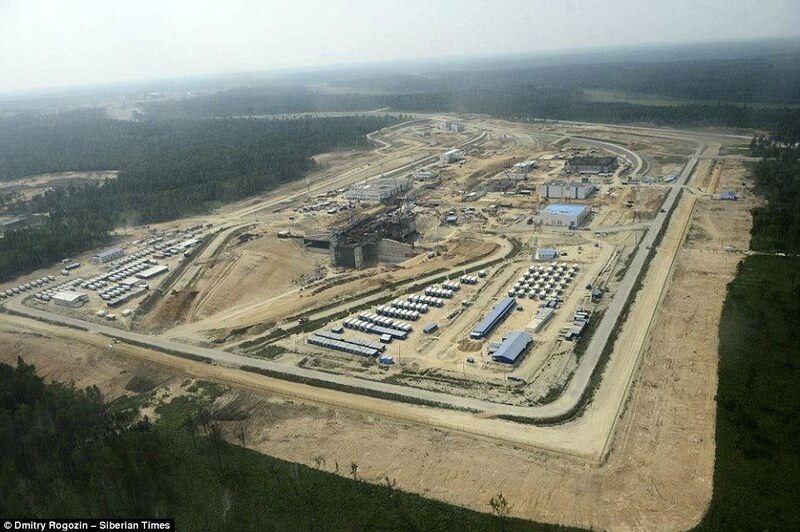 The sprawling 551 sq km Vostochny complex, close to the Chinese border, will employ up to 25,000 people. Architects say the new community will be a 'one-of-its-kinds scientific and tourist space town with a unique design and beautiful landscape'. 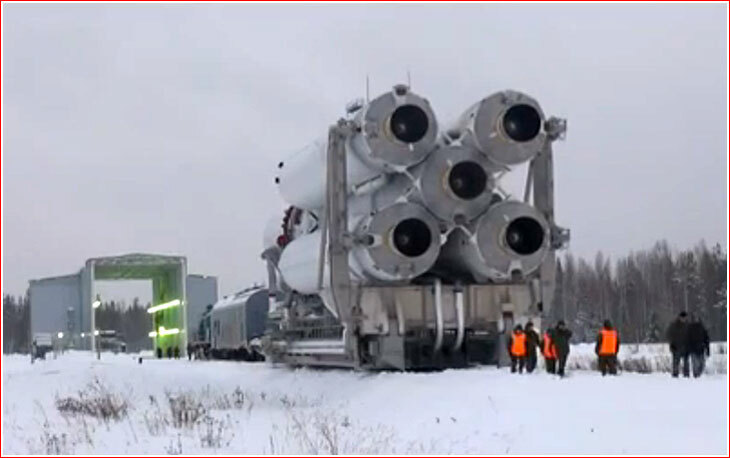 There will be three launch pads - one for the Soyuz and two for Angara rockets. The mobile service tower is the highest structure at the site, similar to one that TsENKI expert built at Kourou in the French Guiana. It is designed to service a rocket already on the launch pad and will travel to it. 'This facility will allow our specialists to work in comfort any time of the year,' said Elena Toropova, the head of the department of monitoring for the mounting of technological processes and transitions. 'Frosts here are over -40C and strong winds and sometimes we have to stop work. Rocket launches will be conducted mainly in the winter. 'Now there is only mounted metal, but we will insulate the tower, and it will be coated, supplied with electricity and water. The roof at the tower is removable, so its size can be enlarged for further launch of manned rocket.' 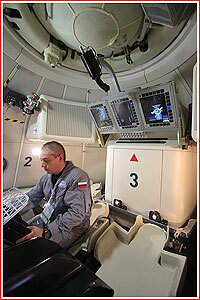 One such manned project includes the exciting mission to send a Russian to the Moon in 2029. Ms Toropova added: 'We have the best specialists in the world here and everyone is working around the clock. Another unique aspect of the complex is the world’s highest refuelling cable mast. News that the site is now ahead of schedule will be welcomed by the Kremlin, which had intervened earlier this year amid a series of delays. The project was also engulfed in claims of financial corruption, with Russia’s Accounts Chamber uncovering the construction costs have been overstated by $180million. Testing of the new rocket technology is on-going and, according to the draft Federal Space Programme for 2016-2025, there will be several lunar missions in 2021 and 2022 leading up to the landing of cosmonauts themselves in 2029. While the Angara-A5V has been chosen for the first manned space mission, test flights involving the rocket are still ongoing. MOSCOW, June 4. /TASS/. In January 2016, after the first launch from the Vostochny cosmodrome in the Russian Far East, the construction of two new launch pads for various modifications of the Angara carrier rocket will be started, Russian Deputy Prime Minister Dmitry Rogozin said on Thursday. "In January, just after the blast-off from the first launch pad we will immediately proceed to the second stage of the Vostochny cosmodrome construction," he said in an interview with the Rosiye 24 TV channel. 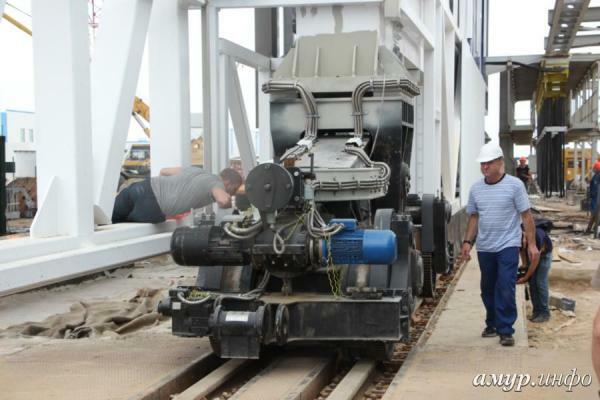 "The construction scope will be expanded for installing two more launch pads for the Angara rocket." The deputy prime minister said that it will be universal launch pads for the Angara A5, Angara 5V rockets and the light class Angara rocket. According to him, the plans also envisage the construction of an airfield at the spaceport, roads and other infrastructure. 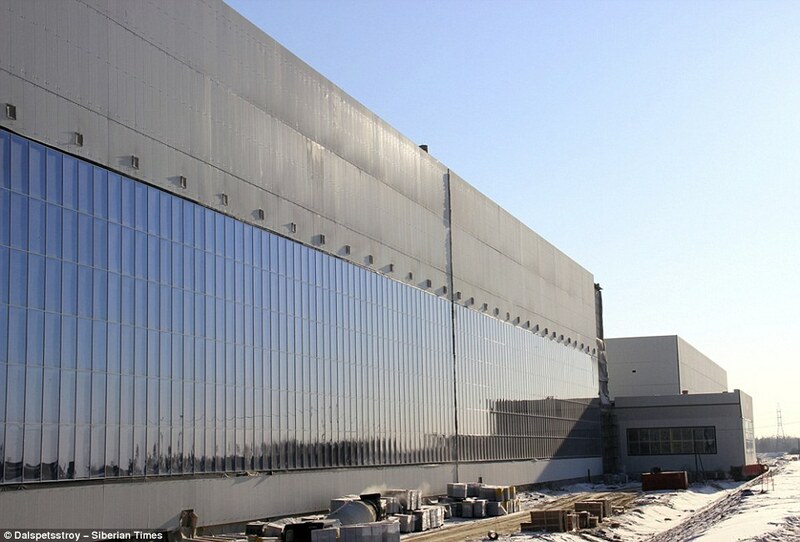 "There are plenty of plans and all of them are also provided with cost estimating documentation," Rogozin said, adding that normalisation of the construction progress has taken a major effort and it was also necessary to "learn the language of the builders," as well as to overcome problems with a multilayer subcontracting system. The construction of the Vostochny cosmodrome in the Far East has reached the required pace, Russian Deputy Prime Minister said. 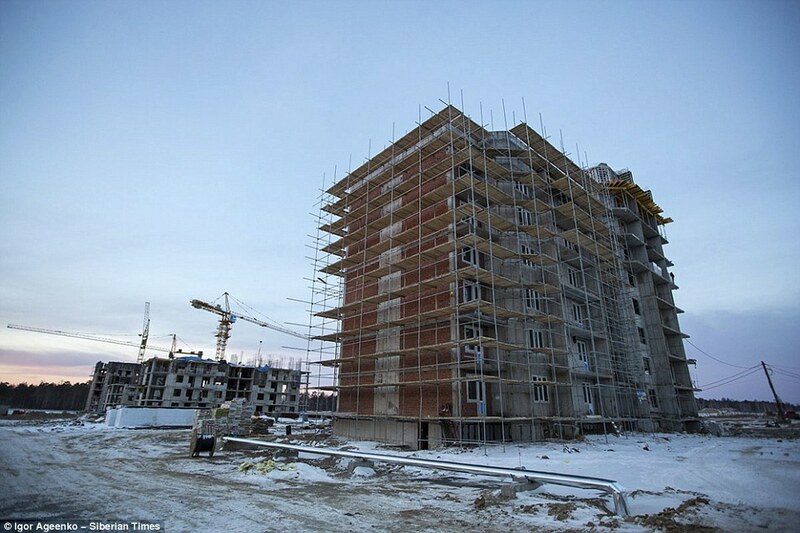 "The construction pace is finally at the necessary level," Rogozin said. The construction works have entered the final straight and preparations are underway for the launch of the carrier rocket that is expected in December this year, he said. 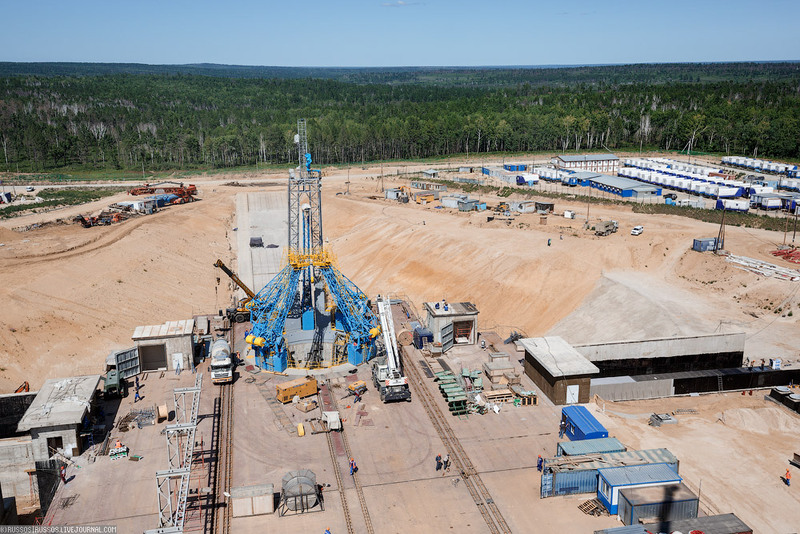 "We are finishing the main construction works at the launching pad which should be ready to receive sophisticated sensitive technological equipment manufactured by the plants of Roscosmos [Russia’s space agency]’," Rogozin said. Rogozin has thanked the students who are arriving at the construction site. "This year, we will have around 1,500 students. They will ‘rock’ this construction in a good sense," he said, adding that even the arrival of 500 students last year helped to ramp up construction. The Vostochy cosmodrome is being built near the Uglegorsk town in the Amur region that will soon get the name of Konstantin Tsiolkovsky. The complex will include two launch facilities, an aerodrome, cosmonauts’ flight training facilities, an oxygen-nitrogen plant and hydrogen plant, 115 kilometres of automobile roads and 125 kilometres of railways and other facilities. The first rocket to be launched from Vostochny is to be the Soyuz-2.1a, made by the Progress Rocket and Space Centre. The carrier rocket will place into orbit the Samara satellite Aist-2, the SamSat-218 nanosatellite of the Samara State Aerospace University and the Lomonosov satellite of Moscow State University (MGU). The main pad in the photo's is for the Soyuz-2 with the first launch at the end of this year. At the start of 2016, the 2 pads for Angara will be built, one for all models and one for Angara 5 (unmanned) and 5P (manned). When the Angara family of rockets was originally proposed in the 1990s, it was advertised purely as a launcher of unmanned military andcommercial satellites, which previously relied on Proton vehicles. However, as the project had finally started moving forward in the second half of 2000s, its scope widened to include possible manned missions as well. 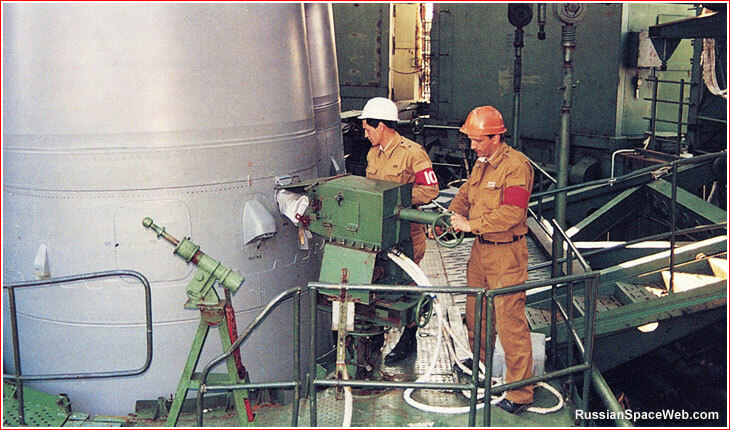 After entertaining the ideas of launching a 12-13-ton three-seat piloted spacecraft on the Angara-3-based rocket (alternatively known as A3M, 3P or 3.2), engineers switched to a more powerful Angara-5 version around summer of 2007. Simultaneously, the operational pressure and the thrust of the rocket's RD-191 engines was to be reduced to a more explosion-proof level to increase the safety for the crew. Moreover, a manned ship with an estimated mass of around 20.8 tons carrying a crew from six to four people could now be inserted into the low Earth orbit. 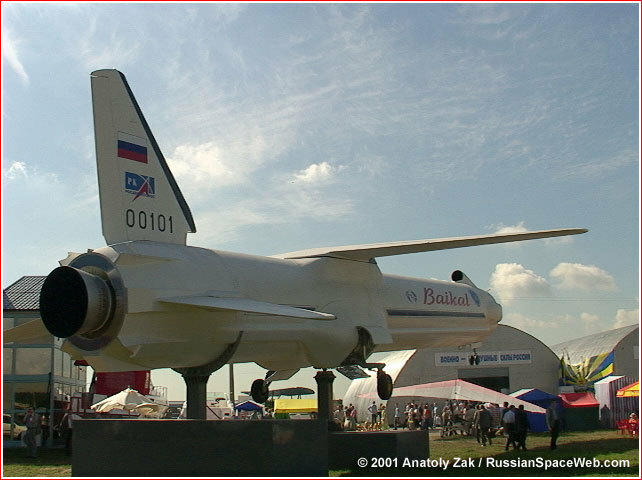 In 2008, GKNPTs Khrunichev, a Moscow-based developer of the Angara family, unveiled a scaled model of a two-stage, 712-ton booster designated Angara-5P, where "P" stood for "piloted" or "manned." Somewhat surprisingly, the company said at the time that the vehicle would be based at a near-polar circle launch site in Plesetsk, which had never hosted manned missions. Moreover, the paperwork also claimed that rocket could carry piloted and cargo ships to escape Earth orbit on their way into deep space. 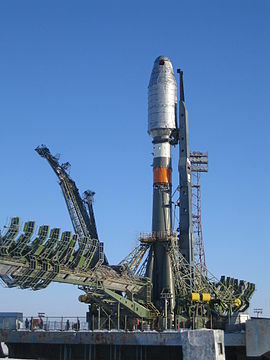 The Angara's role as a carrier of manned spacecraft finally become official, after funding foes had killed the development of the competingRus-M rocket in 2011. By that time, the Russian government had already launched the construction of a new cosmodrome in the Russian Far East and the Angara-5 rocket was promised a launch pad there. Under Roskosmos' tender announced in July 2012 under code name Amur (after a great Siberian river), the Angara-5 rocket would be customized to fly from Vostochny, carrying a 20-ton new-generation PTK NP spacecraft into the low Earth orbit. 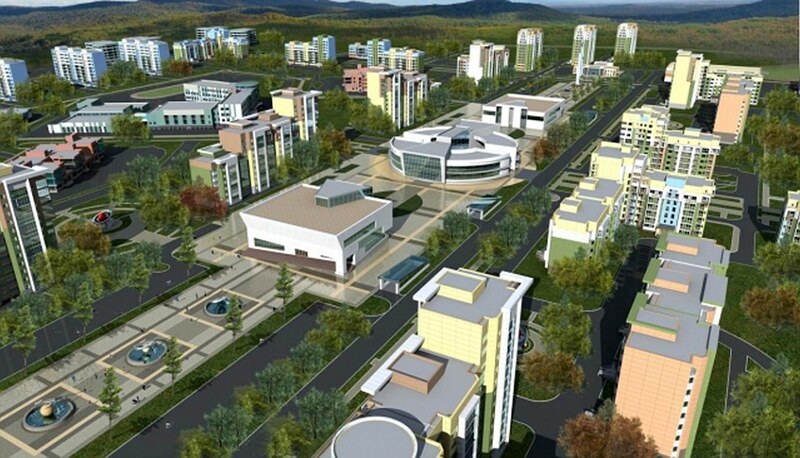 The first phase in the development of the Amur project would run until the end of May 2013, Roskosmos said. 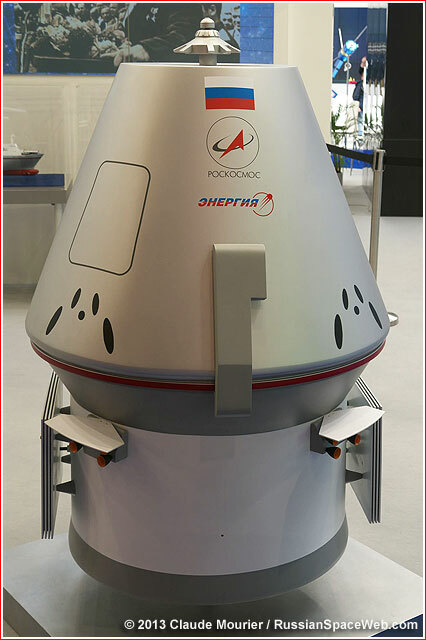 Given the fact, that any deep-space exploration missions might not take place until 2030s, Angara-5P could be the main carrier of Russian manned spacecraft during most of the 2020s. Moreover, GKNPTs Khrunichev proposed deep-space mission scenarios, where the manned vehicles would still be launched on Angara-5P and dock in the low Earth orbit with large space tugs delivered by super-heavy rockets. 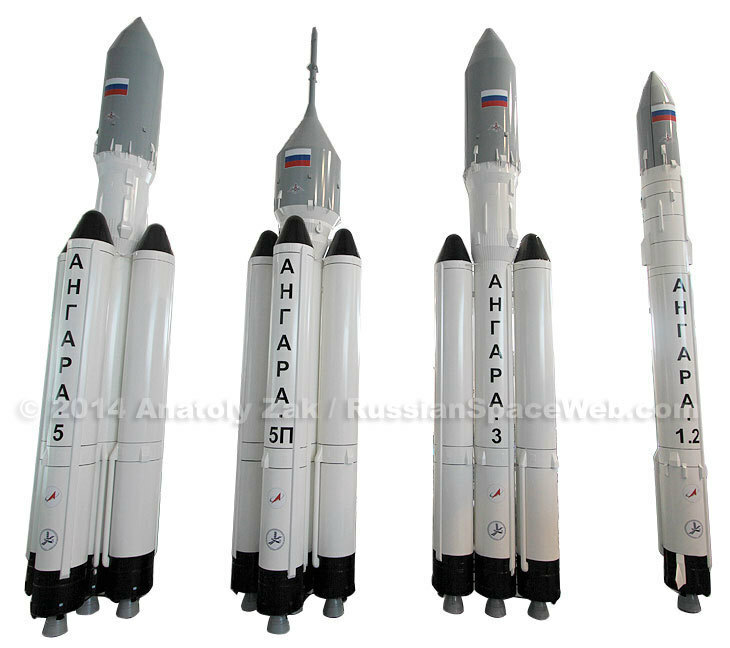 In the meantime, the design of the Angara-5P rocket went through a number of incarnations as evidenced by scaled models appearing at various shows. By 2011, the rocket "lost" its upper stage, which had previously been mounted on top of a five-booster cluster, emulating the design of a basic unmanned Angara-5. Instead, on the manned version, the central core booster with 127.5 tons of propellant would now act as a second stage, after four first-stage boosters had exhausted their total of 510.6 tons of propellant. According to known specifications of a two-stage Angara rocket, its spent strap-on boosters would impact the ground 1,300 kilometers from the launch site. The payload fairing would be dropped 1,440 kilometers downrange. Apparently, in an effort to "man-rate" a two-stage Angara, Khrunichev considered throttling down RD-191 engines to a lower but safer thrust of 185 tons. As a result, just five engines with single combustion chambers would be required to deliver at least 18 tons of payload into orbit! For comparison, the Soyuz rocketslaunching 7-ton spacecraft use six four-chamber engines with a total of 24 combustion chambers! The Angara-5 P rocket could still have an ability to lift off and fly to a safe distance from its launch facility even when one of its five engines fails during launch. Launched by a two-stage Angara, the manned spacecraft would probably use its own engines to enter an initial parking orbit and then maneuver itself to a space station, to rendezvous with a space tug or to conduct an autonomous orbital flight. 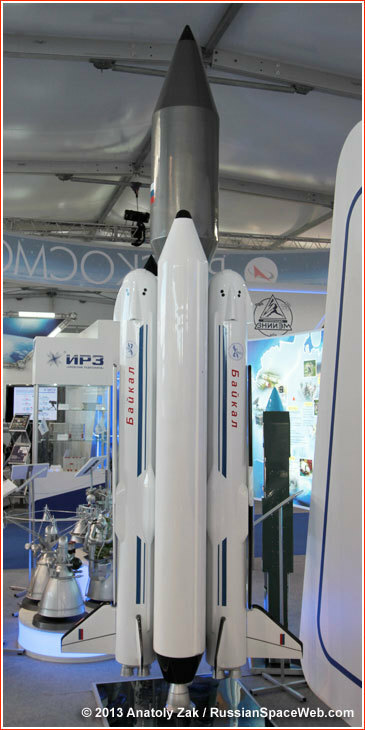 The latest configuration of Angara-5P was unveiled at the Moscow air show, MAKS-2013, unfortunately without any official specifications. Apparent changes in the design of the rocket were seemingly limited to the payload section. The protective fairing became wider, fully covering a manned spacecraft with a re-designed emergency escape rocket. However the status of the project and the flight profile of the proposed vehicle remained largely a mystery, as of the second half of 2013. In May 2014, the Director General of the TsNIIMash research institute Aleksandr Milkovsky, said that the new development schedule for the PTK NP spacecraft postponed the beginning of the flight tests from 2018 to 2021. However, according to Milkovsky, the testing will start with the lunar version of the spacecraft, rather than its Earth-orbiting variant. At the same time, Milkovsky said that the flight tests would be conducted with the help of a new heavy vehicle, which would replace Proton, obviously referring to Angara-5P. They are NOT messing around, are they? Niiiiiiice. Can't wait to see those Super-Heavy variants take wing. Wait till you see the other shots...I maxed out the 2mb limit...will post shortly.....This is one mega site...and civilian for all countries....I'm liking this site for science launches....I am sure other outfits will be putting offices here in the future, kind of like an international spaceport. All nice, shiny, new facilities. Gotta hand it to Russia, they don't muck about when they want to build something and have cleared out the "dead weight". The place looks fantastic now, and it'll only get better. 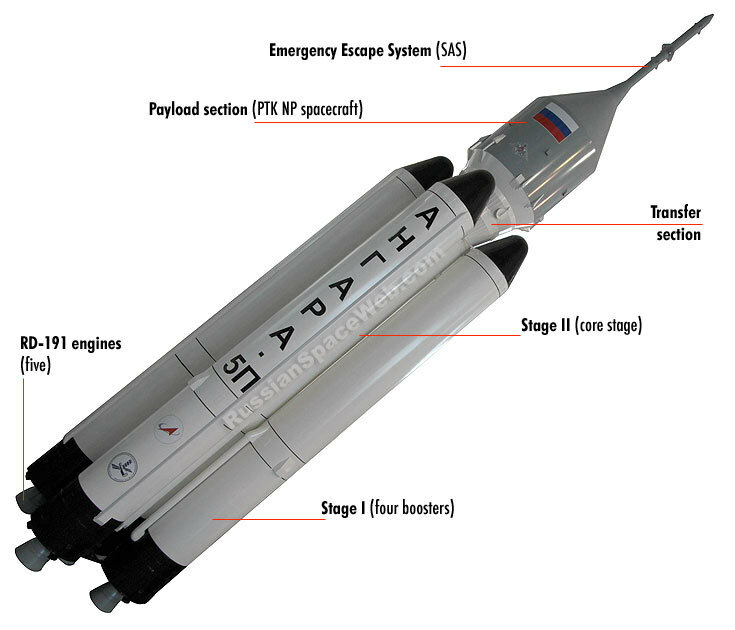 In this post, I will put up some preliminary data on the new proposed Russian manned capsule, designated PTK NP which will be eventually tied to the Angara 5P manned launcher. 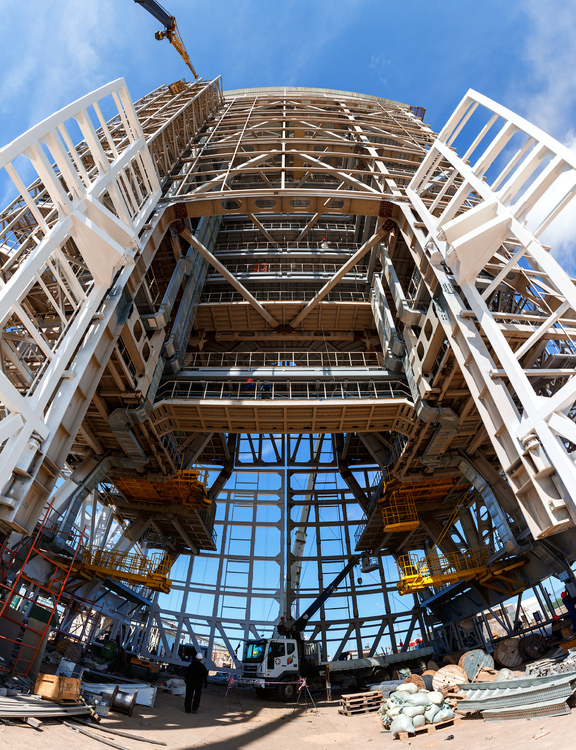 Two new pads for the Angara will begin construction in early 2016 at the Vostochny Cosmodrome. The majority of news appears to be related to the big push at Vostochny, of which the Soyuz launcher is near completion of that phase. Next will be the Angara launch pads. What I have here is preliminary, and at best, 1 year old data. The focus has changed many times for the new manned capsule, but it appears that it will be a 4 man unit, configurable for LEO and lunar missions, will be able to dock at the ISS, will have chuted landing with steerable rocket braking at 10 meters above the surface during landing. The interior will have a new seating system, foldup data console and side thrusters similar to Dragon V2, will incorporate a space tug to push the capsule into a lunar orbit and will have landing legs. I will keep trying to find some updated goodies but I have a bit here to start with. Any errors that you find, please help to correct, as we all would like reliable data. As of August 2013, the PTK NP spacecraft featured an ablative non-reusable thermal protection system attached to removable panels. In their turn, panels carrying ablative layers would be attached to the metal skin of the spacecraft with a special glue. After each flight, the descent module would be stripped of its partially burned heat shields and new panels would be glued to the reusable metal structure of the module. A special chemical solution was developed to remove glue residue from the metal skin of the vehicle without any damage to the structure. RKK Energia engineers said that a tradeoff analysis had shown little benefit to using a fully reusable thermal protection system. In addition, latest studies showed that using a single type of thermal protection panels on all sides of the conical module would greatly simplify the manufacturing of the thermal protection layers, even at the price of a small increase in a total mass of the spacecraft. Previously, the conical surface of the descent module was to be covered with two types of protective shielding: a thicker and heavier layers on the side exposed to the most intensive thermal effects of the reentry and thinner, lighter layers on the opposite side of the vehicle. RKK Energia specialists noted that unlike the Space Shuttle and other winged vehicles, the temperature difference on the underside and on the top side of the capsule-like spacecraft would be less drastic to justify the cost of developing two types of shielding. PTK NP would still have more capable protective system on the bottom heat shield bearing the brunt of thermal pressure at the reentry. The PTK NP spacecraft would still feature the rocket-propelled landing system, however its role was reduced to an auxiliary propulsion following the deployment of a triple cascade of parachutes. A simultaneous opening of each of three main parachutes would be preceded by a deployment of trio of pullout parachutes and braking parachutes. The rocket-propelled landing system would be activated at an altitude of only 10 meters above the surface and provide soft landing. Unlike small soft-landing engines on the Soyuz spacecraft, which fire a moment before the touchdown, PTK NP's solid-propellant motors would still have a sophisticated thrust control and much more capable in controlling the landing speed and the exact point of landing. However, initial plans for a complete reliance on rocket engines during landing were dropped. RKK Energia representatives disclosed that the stiff resistance to the rocket-powered landing system came not only from veteran managers at TsNIIMash but also from cosmonaut ranks. "The (concept) of falling like a stone from the sky down to an altitude of just under a kilometer sounded way too radical to many cosmonauts," an RKK Energia representative said. 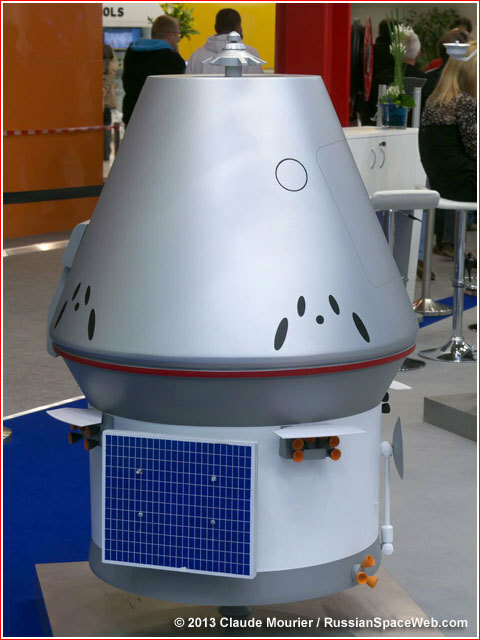 Under all circumstances, the descent module of PTK NP spacecraft would land as a single vehicle with all its components in place, for the exception of a detachable bottom heat shield. However between the flights, the descent module would be split into three main segments for easy access and servicing. Apollo by The Numbers. A Statistical Reference. By Richard W. Orloff. NASA History Division. Office of Policy and Plans. NASA Headquarters Washington, DC 20546 NASA SP-2000 4029 2000, Revised, September 2004 ISBN 0-16-050631-XA. During 2014, the Russian space agency, Roskosmos, requested funding for the PTK NP project within its new 10-year space program, which would come into effect in 2016. The 2014 draft of the program requested 60.7 billion rubles for the PTK NP project spread over a decade, as shown below. However, the question remained whether this budget could be afforded given latest economic and political developments in Russia. By 2013, various sources enabled to compile an emerging picture of the flight test program aimed to validate the PTK NP spacecraft for manned missions. According to official statements, up to three launches of the Zenit rocket beginning as early as the middle of 2018, would carry unmanned prototype of the spacecraft into low Earth orbit, possibly, culminating with a docking at the International Space Station. At least one launch on a Proton rocket, or (if the mass of the vehicle could be dramatically reduced -- on a Zenit rocket), would accelerate PTK NP's crew capsule to match the velocity of a mission returning from the Moon. The flight would test the capability of PTK NP's heat shield to withstand the atmospheric reentry. 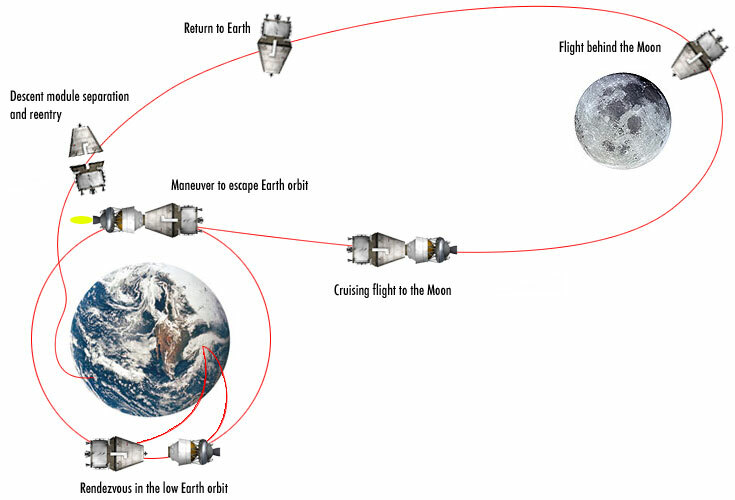 A dual mission launched by a pair of Proton rockets would see a docking between the unmanned PTK NP spacecraft and a Block-DM space tug capable of sending the spacecraft to fly by the Moon. All these initial test flights were expected to originate in Baikonur. It is logical to assume that the switch of the PTK NP spacecraft to theAngara-5-derived launch vehicle based in Vostochny would require additional unmanned launches into low Earth orbit. Finally, with the appearance of a heavy-lifting launch vehicle, two unmanned versions of the PTK NP spacecraft were expected to fly test missions into lunar orbit, paving the way to a manned circumlunar flight by 2030. (642) At the time, Russian space officials predicted the first launch of the Yenisei-5 heavy-lifting launch vehicle from Vostochny Cosmodrome around 2028. Unmanned flight around the Moon launched by a "prospective launcher"
*By the fall of 2013, the launch dates were postponed by a year. I'm happy to see that Russia is finally moving forward with a Manned Lunar programme. Their new gear looks fantastic, and the new Spaceport shots are great too. Thanks for all the research DD! I always enjoy reading the stuff you and DocM find. You two can always be counted on to keep my neurons firing at peak capacity when I need a break from development. 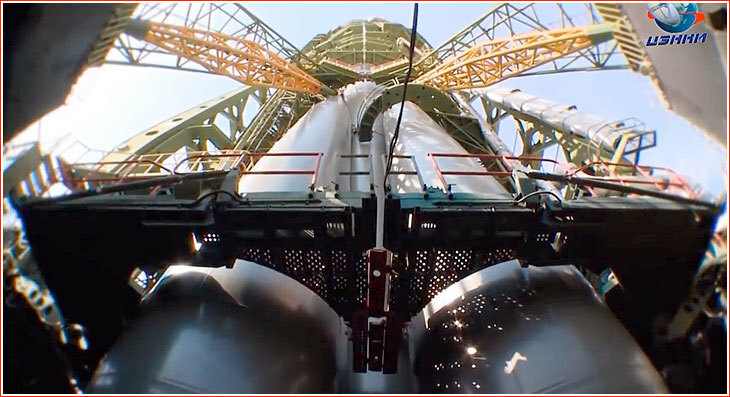 The first phase of the cosmodrome appears to be rolling along and focused for a late December Soyuz satellite launch. With the first launch pad and its auxillary systems in place, multiple phases will commence. 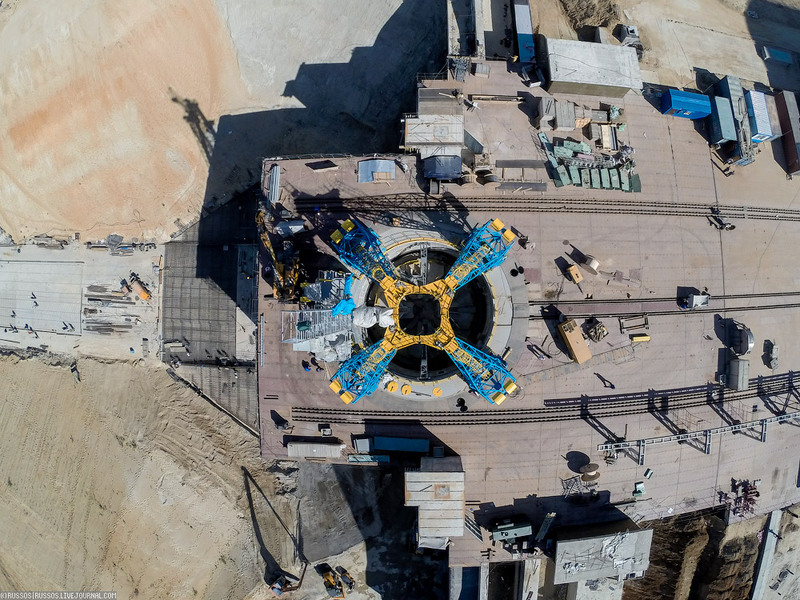 The housing section will be done in three phases, in reference to pad completions such as the Suyuz 2 pad for phase one, Angara pads for phase two and heavy lifter pad for phase three, once formalized. The heavy lifter will also incorporate the reusable booster program. The airport to service the cosmodrome has begun. 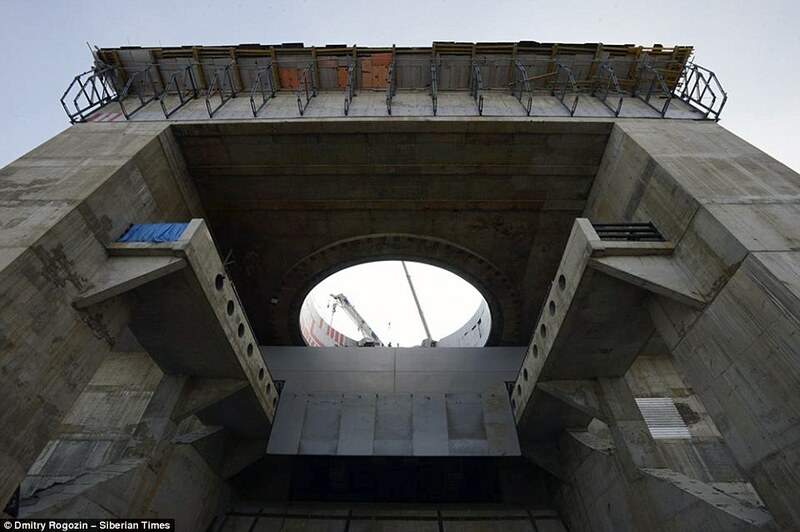 More than seven years after the approval of the Vostochny project, this expensive piece of infrastructure was apparently overshadowed by many other priorities within the massive project, such as the launch pad, the processing facility and theresidential area. 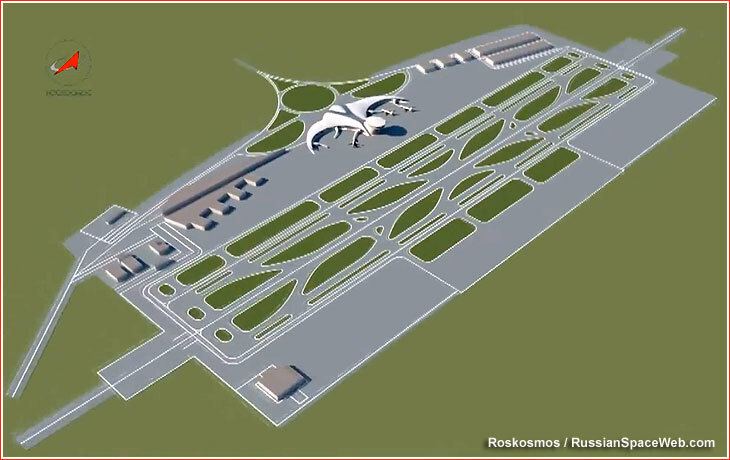 On June 5, 2015, the head of Roskosmos Igor Komarov told journalistis that the construction of the airport had been finally starting. This is an artists rendition, but final design appears to contain the futuristic terminal and may have the world's longest "commercial" runway due to the fact that it needs to be able to handle the heavy lift transports such as the AN 225 as well as a landing strip for the future horizontal flyin reusable boosters (RRM). 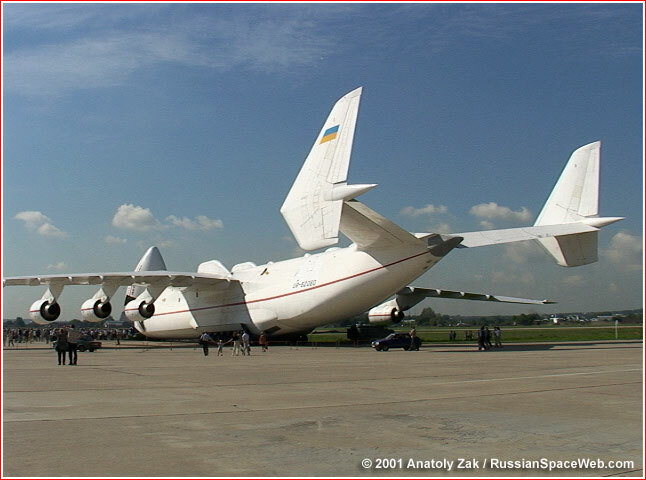 The airport would be designed to receive the world-largest aircraft such as An-225 Mriya. Initially, its runway was to have a length of 3,300 meters, with a later extension to 4,400 meters. The runway would be 60 meters wide. (Original plans called for a width of 75 meters). The passenger area will feature a terminal built in the shape of bat and capable of processing 300 passengers per hour, including 50 passengers per hour at its international counter and 30 passengers per hour at a separate counter for official delegations. The Design and Research Institute of Air Transport, OAO Lenaeroproyekt based in St. Petersburg developed the architecture of the airport. 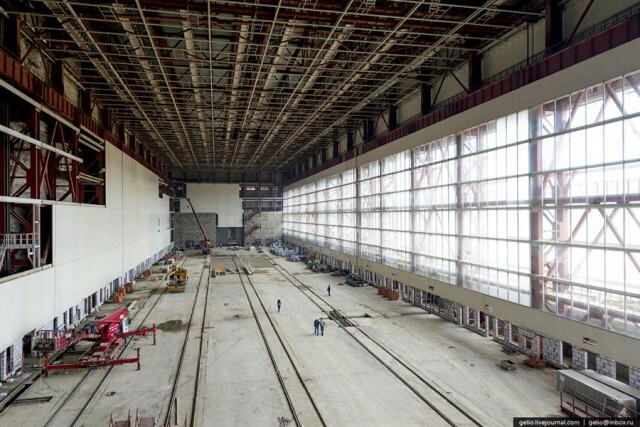 Like all other facilities in Vostochny, the airport for the space center was conceived on a grand scale. 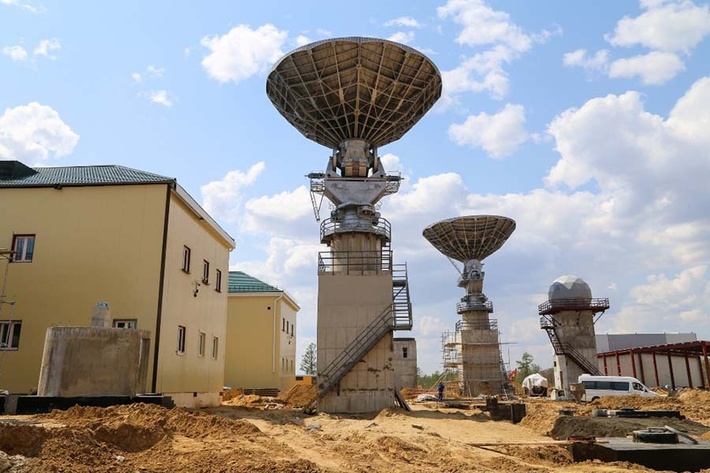 The newly-built A-class runway will be located at Site 5, around 12 kilometers north of Uglegorsk, the main residential area of the space center and boast a staff of 500 people. A 20-kilometer road with wide-radius turns will connect the airfield with the main processing areafor rockets and spacecraft, allowing the delivery of large containers with spacecraft or even whole rocket stages. Artist's concept of Russia's proposed reusable Re-entry Rocket Module (RRM) booster landing on the runway. The first flight of a reusable Russian rocket booster that returns to the launch pad under its own power could occur by 2020, Russian space officials say. The flyback booster, called the Re-entry Rocket Module (RRM), is part of a larger Russian project that aims to develop a partially reusable rocket called the Reusable Integrated Launch Vehicle, or RILV. 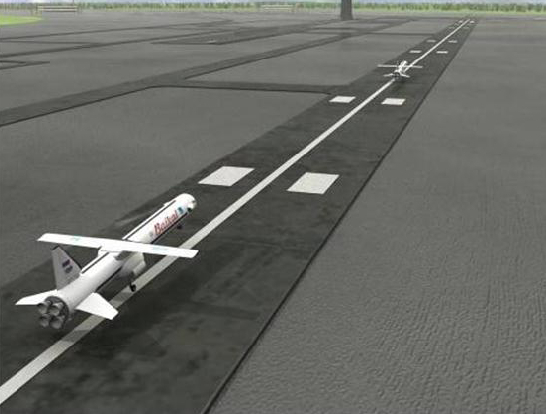 The RRM would be the RILV's first stage. The RRM is designed to operate for 100 launches, and its main engine, called the liquid-propellant rocket engine (LPRE), will be initially re-ignitable 10 times, with an ultimate goal of 25 uses. The LPRE will burn liquid oxygenalong with methane or kerosene, officials say. "We will finish the [RRM booster’s] preliminary design by September 2013, and our next step will be the development of the demonstrator system, which will include an engine like this one [LPRE]," Anatoly Kuzin, Khrunichev’s deputy general director, said Oct. 3 at the International Astronautical Federation’s 63rd congress in Naples, Italy. The RRM will have four LPREs as engines, Kuzin added. If one fails during ascent, the others will increase their thrust to 130 percent of their normal levels. In addition to conventional rocket technology, the RRM will use aviation components, design philosophies and technologies. After its flight, the RRM will cruise back to its launch site autonomously, using a wing, along with airbreathing jet engines located in its nose. Two RRM designs are being studied, one with a conventional "pivoting wing" and the other with an aerodynamic "tapered wing." The RRM nose shape is optimized for the aerodynamic needs of re-entry flight and to accommodate the booster’s jet engines, fuel tank, pneumatic and hydraulic mechanisms, and avionics, Kuzin said. The booster’s three-wheeled landing gear is stored in the nose and fuselage. Like an aircraft, the RRM has a vertical fin with a rudder installed in the tail section. The larger RILV rocket that the RRM will power is being developed under the Russian space agency's Phase 1 Reusable Launch System project. The RILV is envisioned to be a family of four launch vehicles that can put between 55,000 and 132,000 pounds (25,000 to 60,000 kilograms) of payload into low-Earth orbit (LEO). 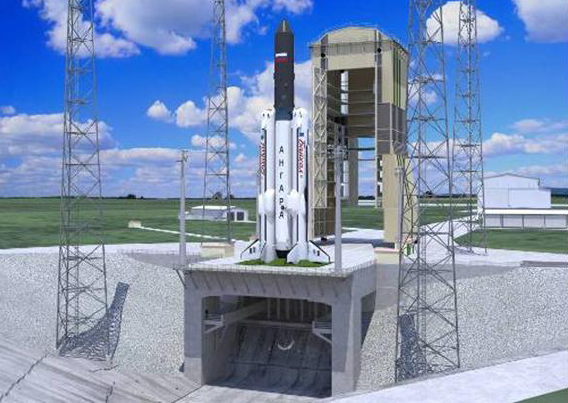 Artist's concept of Russia's proposed Reusable Integrated Launch Vehicle (RILV) on the pad. 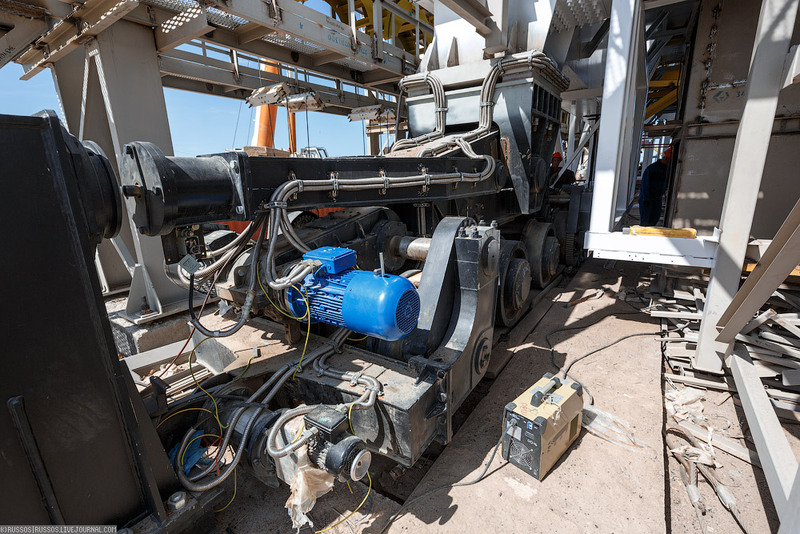 The 55,000-pound version uses a single, two-stage core and one RRM. The 77,000- and 99,000-pound RILV models use a similar core, but incorporate two RRM boosters instead of one. The 132,000-pound variant uses a longer two-stage core and two RRMs, Kuzin said. The RILV core stage will likely also use the LPRE, which has been in development since 2006. The RRM will separate from the RILV core stage at an altitude of up to 34 miles (55 kilometers) above the launch site, while travelling at about seven times the speed of sound, officials say. 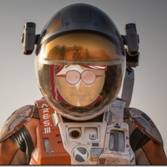 The RRM will then carry on in a suborbital coast. When it descends to an altitude of about 12 miles (19 km), it will tilt its wing and engage in a turning maneuver using its jet engines. The booster will then cruise home to the launch site’s runway, probably from a distance of about 93 miles (150 km). The U.S. Air Force Research Laboratory announced a similar project in 2011 called the Reusable Booster System. The American version would also employ a reusable first stage that could fly back to a runway at the launch site. Instead of using airbreathing jet engines, however, the U.S. craft would rely on its rocket engine to decelerate after staging, then use that engine again to cruise back to the runway. No date has been given for launching a demonstrator system for the U.S. version. Got a few more neat shots. 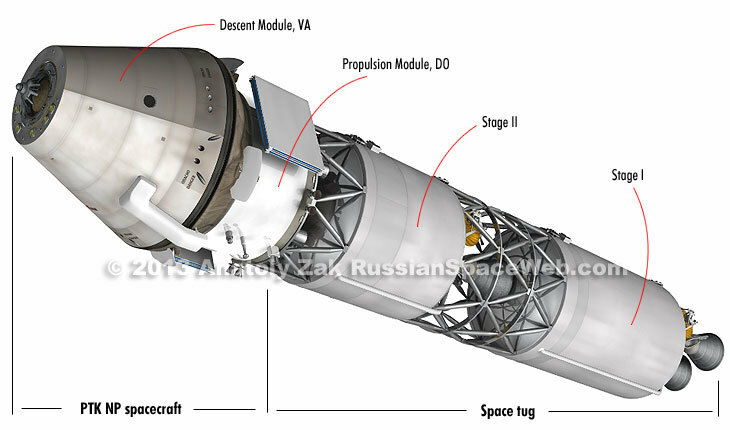 The Soyuz launcher/flame hole is at one end of the multi rail system. Under the launcher is a mobile service platform and a vast sub floor system for maintenance, testing and fueling support. On top, just behind the launcher we have the Mobile Service Tower. The tower has large doors in front to encircle the staged rocket. It also has smaller doors on the back which are used to allow an assembled rocket, on an erector, to be moved by rail from the assembly plant, which is very far back for safety, and travel through the tower on the horizontal, to the launch pad, then erected. From that point, the tower can be moved in for servicing. Here is a sat map that you can zoom down to and see the launch area and follow the rail back to the assembly plant. With this map, you can go to the residential area and the airport area...shot is a bit dated but gives you an idea of the size of the complex. Amazing photos, thanks for uploading. #5 is the four support arms for the Soyuz 2 which hold the rocket suspended over the flame hole. The erector assembly travels through the mobile tower, which is away from the flame hole. 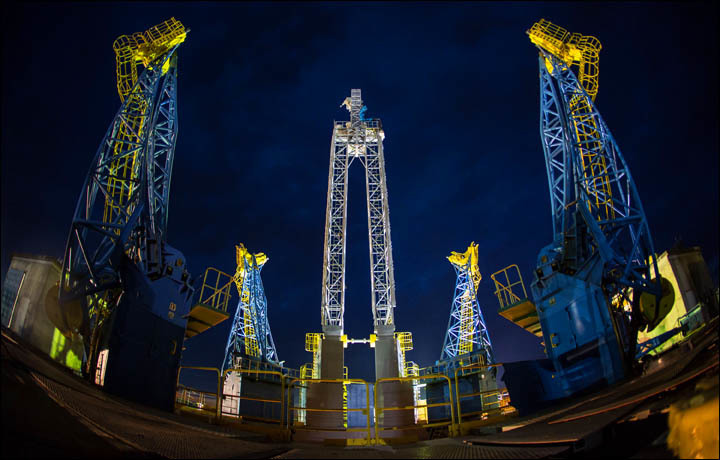 The erector lifts the rocket into position and the four arms are brought around the rocket at it's support surfaces. The weight of the rocket presses onto the four arm pins and gravity holds the arms in place. Then # 6 and #7 are position for lateral support. Those four arms hold the rocket suspended over the flame hole. The lower service platform, #8, can then be brought out and extended upward around the engines. The main service tower can also then be moved up to the rocket and doors closed around the rocket. When launch time approaches, the tower can be moved back. Before launch, supports #6 and #7 are moved away and once engines are fired and lift occurs, the large counterweights of the four support arms will tip out of the way as the rockets weight is lessened on the supports. In the next picture, near the top middle, is a tower base being built. The tower there, will be 130 meters tall, and a similar one on the other side of the flame hole, with two other half sized units to the right of both towers. These are lightning arresters and double as bank lighting support towers. 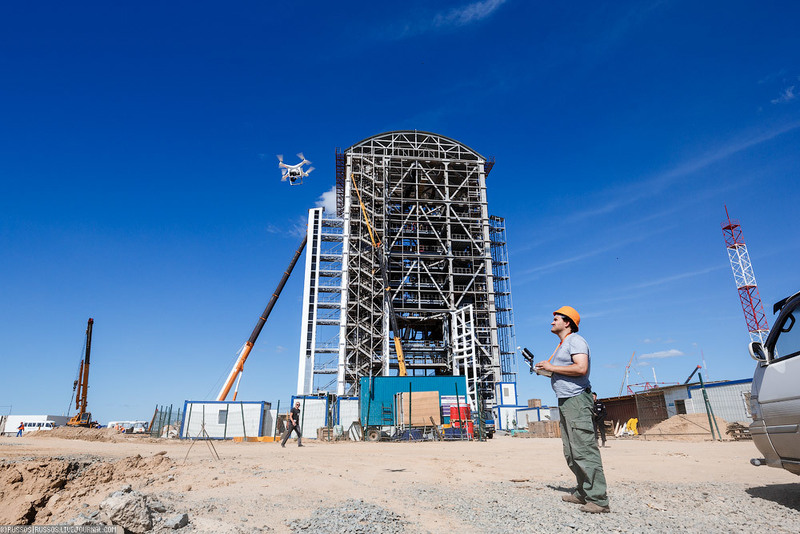 The Vostochny Cosmodrome under construction in Russia has received its first telemetry signals from the International Space Station, a spokesman from the Russian Space System company told RIA Novosti on Thursday. "The first seance with the ISS was held...from 11:00 a.m. to 11:22 a.m. Moscow time [08:00-08:22 GMT] on June 17. The second session was held from 1:48 p.m. to 2:01 p.m. Moscow time [10:48-11:01 GMT]," the company spokesman said. He said the telemetry signals received were satisfactory. 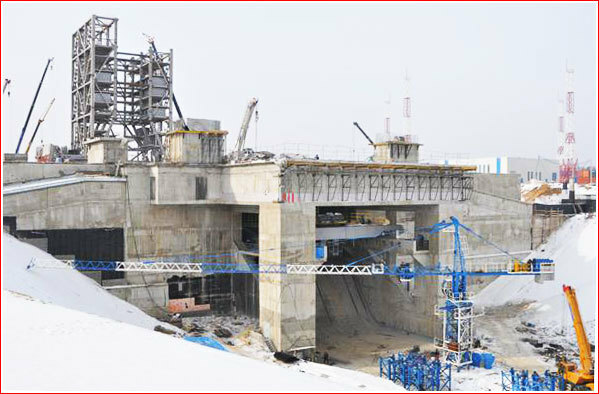 The Vostochny Space Center is under construction in the Amur Region of Russia's Far East since 2012. The first piloted spacecraft is expected to take off from Vostochny in 2018. 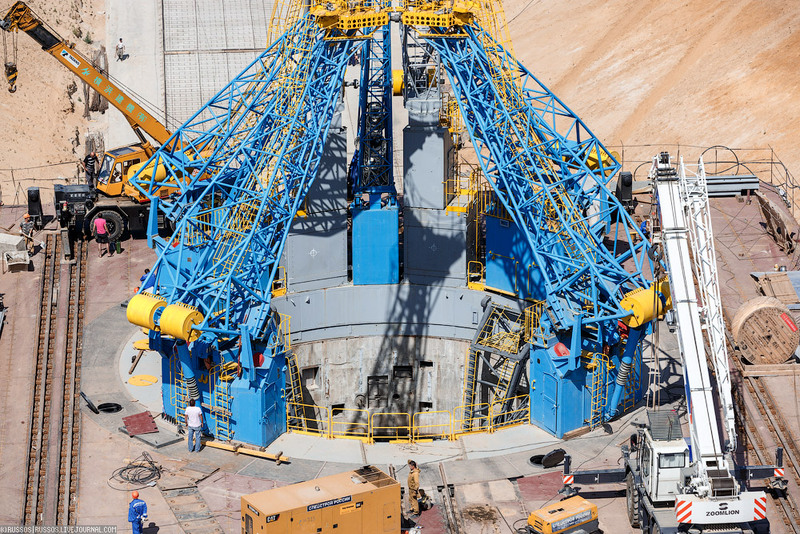 Vostochny will enable Russia to launch most missions from its own soil, reducing the country's reliance on the Baikonur space station in Kazakhstan. So today, I thought I would throw some goodies around about the telemetry site. The telemetry was received by a mobile unit on site while the good stuff is being installed. All equipment is on site, and installation has begun. 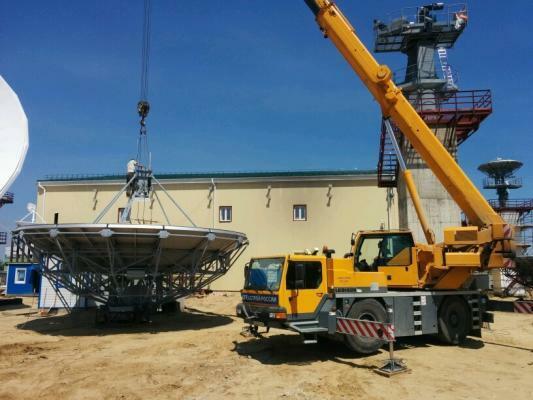 Specialists of Roscosmos finished installation of the first set of equipment at the command post of Vostochiy cosmodrome – uninterruptible power system of the launch site. At present pre-commissioning activities are in progress, press-service of the Federal Space Agency reports. “A total of 13 more high-precision systems will be installed at the command post of the spaceport in order to assure successful launches of launch-vehicles. Installation of 2 out of 13 systems has already been started. 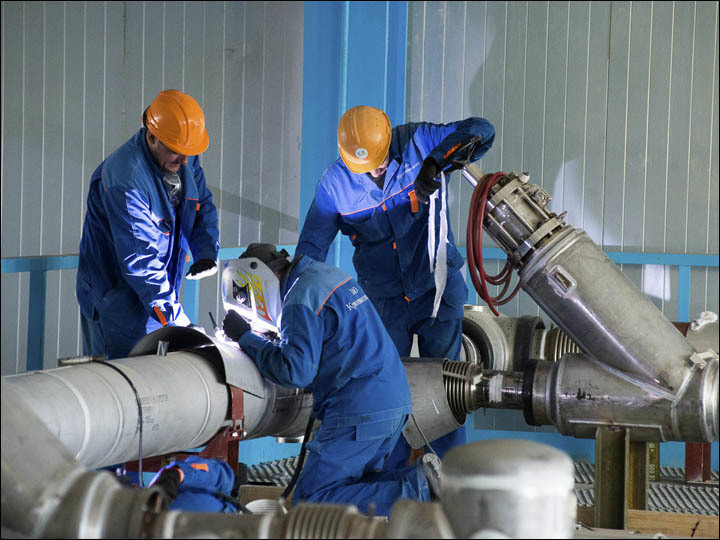 The installation work was completed by the specialists of Space Rocket Center Progress; at present they are controlling installation of other systems. All the necessary equipment has already been delivered to the spaceport,” said in the statement. Uninterruptible power system is the stand-alone power source for all the equipment of the spaceport’s launch site.  In case of power failures the system turns on automatically. Over 300 batteries ensure power supply to the equipment during several minutes, after that the power is supplied from diesel generators. As a result, there are no interruptions in power supply. “This system powers support equipment during launches. In order to do this the equipment is disconnected from all the external power sources – the power is supplied only from diesel generators,” the Federal Space Agency noted. 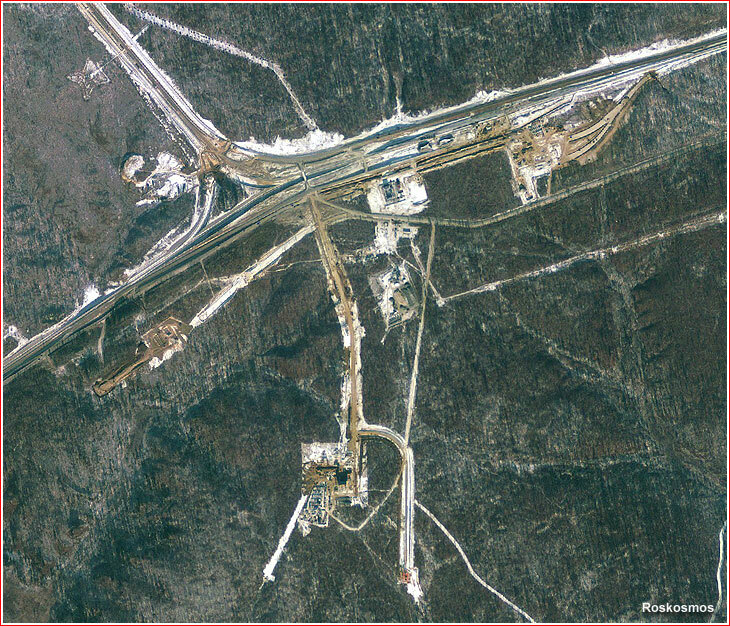 A satellite of the ground station, VKIP at Site 9 (bottom) in Vostochny in November 2014. The main transport artery of the center leads to the launch facilities on the right. The road to the airport heads north (top left). The bottom middle complex is the telemetry center, up and to the left is to the airport,left and down is to the residential centers and right and up is the road to the massive assembly complex and from there, north, is the launch complex for the Soyuz. 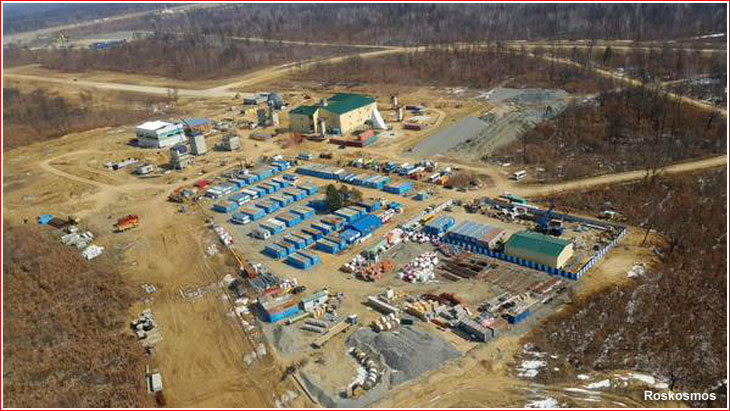 An aerial view of the ground control station in Vostochny. A makeshift town for workers at the KSISO site could accommodate up to 300 people, the official Interfax agency claimed. 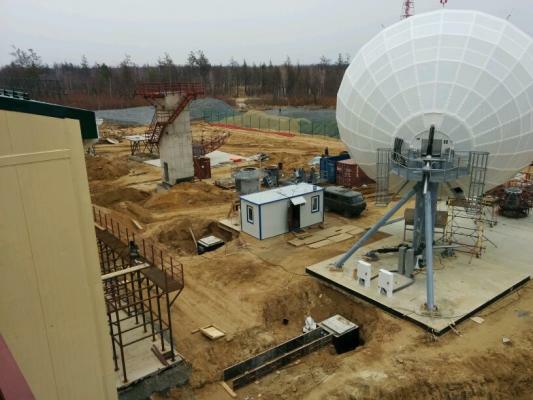 The Vostochny Command and Measurement Point, VKIP, serves as a part of the Complex for Measurement, Gathering and Processing of Information or KSISO. It includes all the facilities for radar and optical tracking of launches, processing of telemetry, predicting of flight trajectories and keeping accurate timing of missions. According to original plans, Site 9 hosting the VKIP station, would be situated on a hill, several kilometers northeast of theairport area. 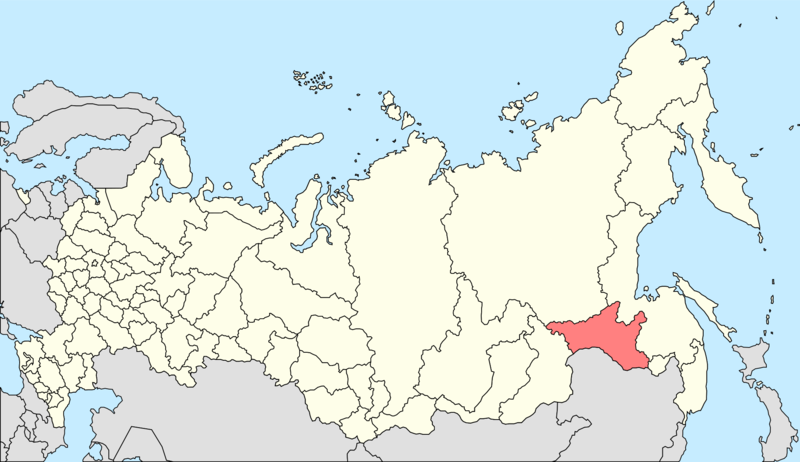 However, by the time the construction started in Vostochny, VKIP had to be moved much farther south, likely because its original area would remain undeveloped in the first phase of construction in Vostochny from 2012 to 2015, while a ground station was deemed necessary for the very first launch. 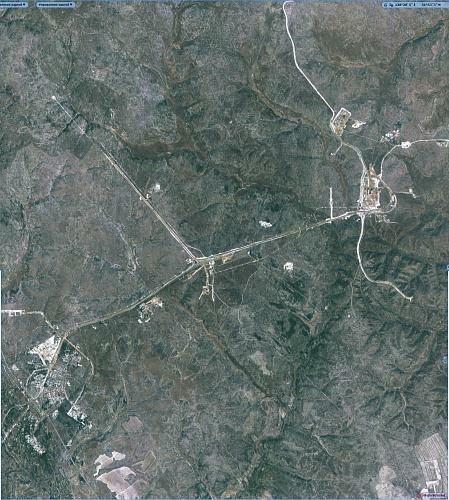 As a result, Site 9 was moved to a hill located southwest of the launch facilities and adjacent to the main road of the center. The layout of the VKIP station nearly matched the perimeter of the abandoned silo for a Soviet-era ICBM, which used to be deployed at that location. In addition to the VKIP ground station, Site 9 also accommodated an indoor car park and a civil defense emergency shelter with a total area of 2,200 square meters. 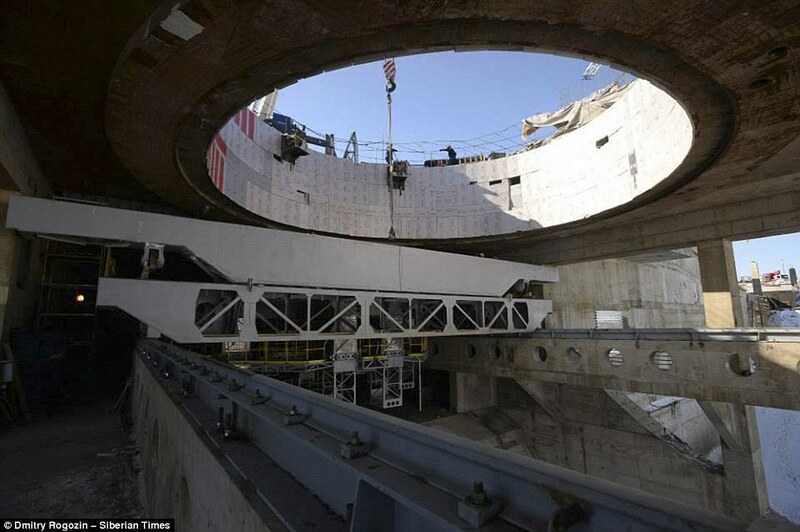 The main ground control building was accompanied by between 11 and 18 concrete towers according to various sources for tracking and communications antennas and by a 85-meter-tall truss structure, which was nicknamed Eiffel Tower. 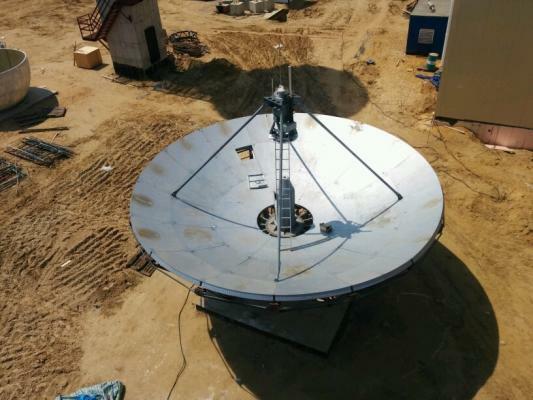 It was reportedly designed for accurate calibration of ground control antennas. 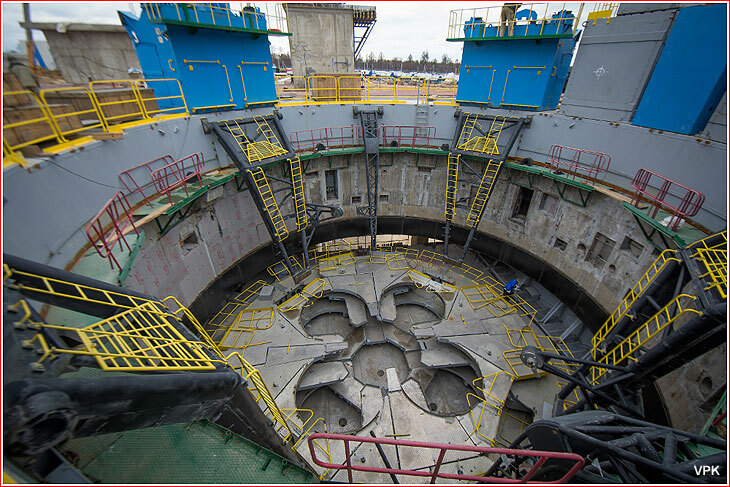 According to Russian space officials, the single ground control station at Site 9 was designed to support all three launch facilities: the Soyuz pad; a dual Angara complex and the yet-to-be approved launch site for a super-heavy rocket. 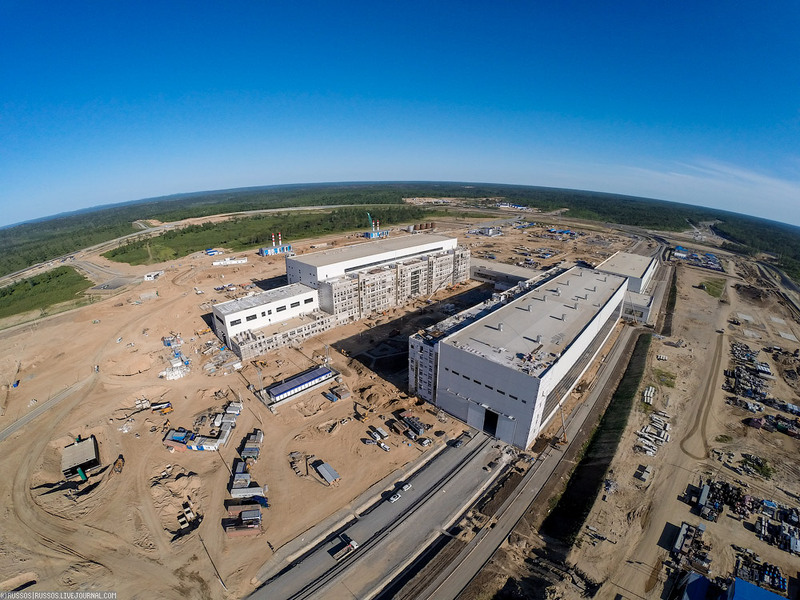 The RKS corporation, which is traditionally responsible for flight control systems within the Russian space industry, completed the preliminary design of the KSISO complex in 2012, cleary behind other facilities in Vostochny. 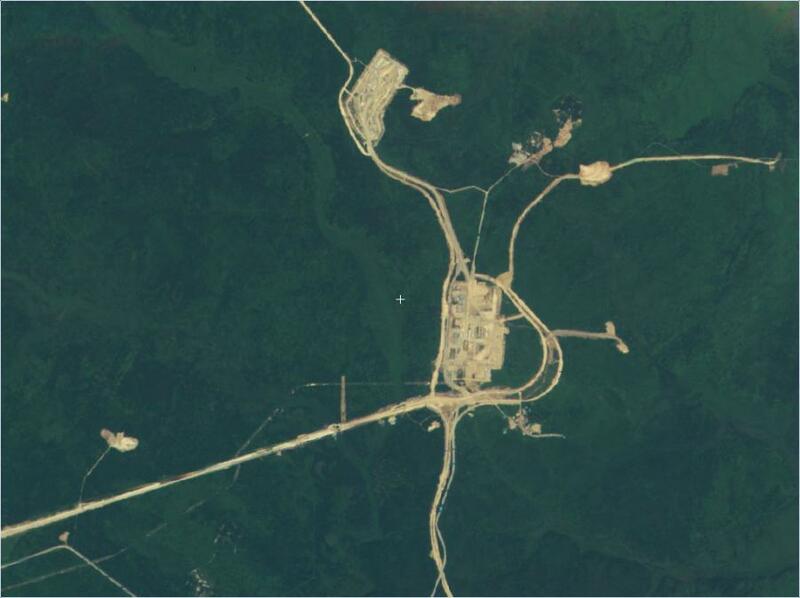 Satellite images showed tree clearing activities and initial construction at Site 9 only in the fall of 2013. Foundations for key facilities at Site 9 were excavated by February 2014. 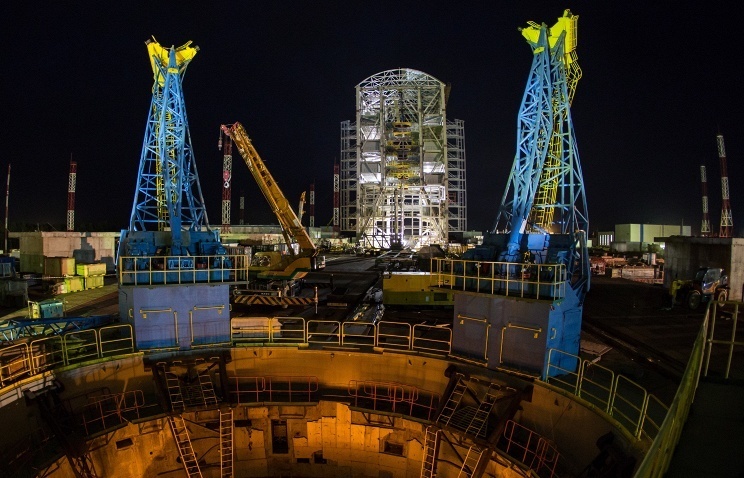 The following month, Spetsstroi, the main contractor on the Vostochny project, reported that the construction was going at full swing at most facilities of the KSISO complex. 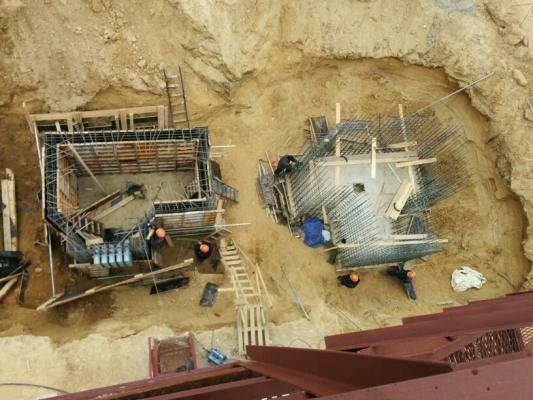 According to the Interfax news agency, 200 workers were involved in the construction of the KSISO facilities by the end of 2014, including the assembly of an 85-meter calibration tower. 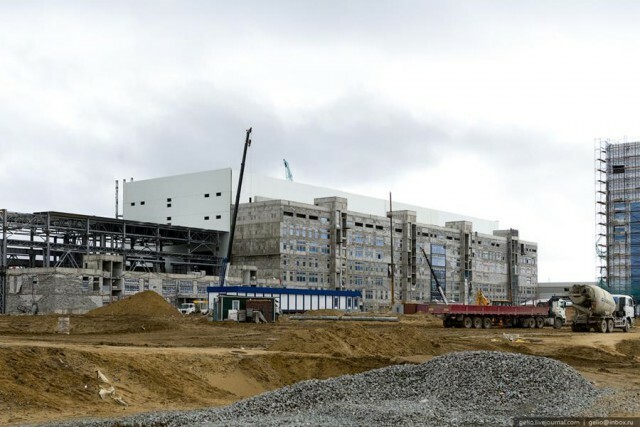 In April 2015, the Spetstroi said that the construction of the KSISO facility was approaching completion under a contract which set a deadline for the project on June 30. 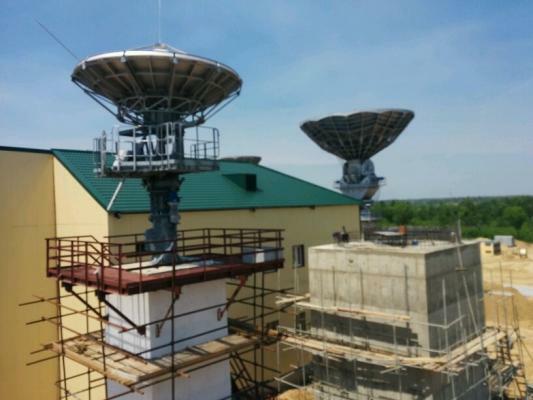 On June 18, 2015, Roskosmos announced that the ground station in Vostochny had began operations. However, the press-release specified that the first data from the International Space Station, ISS, had been received at the site a day earlier by a Mobile (hence temporary) Measurement Station, MIP, which had been deployed at the site by the RKS corporation. 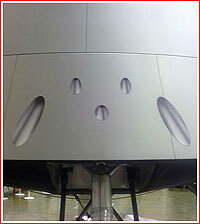 The test aimed to prepare for the launch of the Soyuz-2-1a rocket, the agency said. 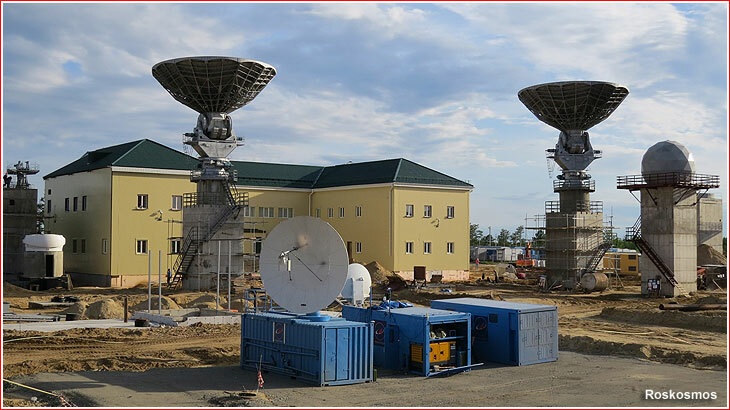 The temporary facility consisted of two mobile containers with equipment capable of transmitting telemetry to Vostochny viadata-relay satellites. At the time, RKS corporation was still waiting for the completion of the permanent site and its wiring to the spaceport's power grid. Roskosmos also planned ground stations located downrange from Vostochny along the flight trajectories of various rockets. 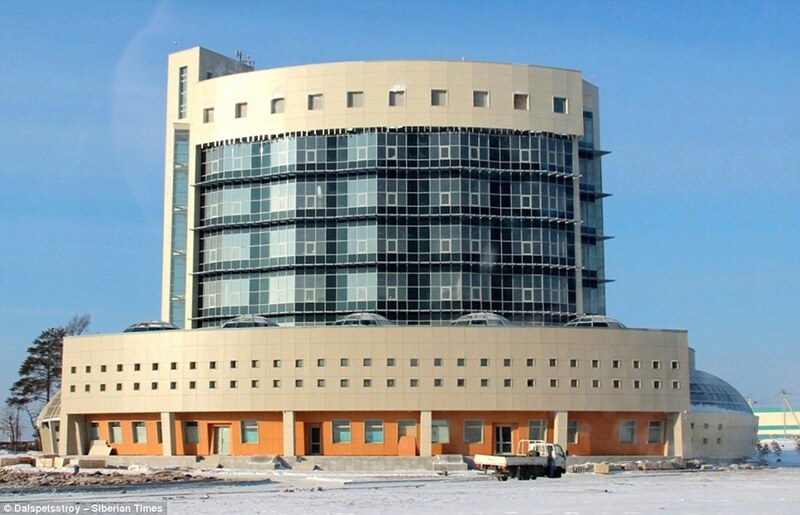 One such site was be located near the town of Tiksi in Bulunsk District, in the Yakut Republic. Looks like a 2 year delay for the manned launch from Vostochny due to prior fiscal mismanagement and financial uncertainty for the future. At least with the re-organization of the their Space Command and all eyes on proper spending, I hope things go well for Vostochny. Russia's space agency Roscosmos is postponing the first manned space flight from the new Vostochny Space Center from 2018 until 2025, local media reported Monday citing the federal space program. According to the Izvestiya newspaper, there is no purpose in launching the older Soyuz ship in 2018, with the first launch being carried out using a new ship with a new Angara-A5B carrier rocket. "We are expecting to reach the preparedness level for the implementation of manned space flights by 2025," Roscosmos spokesman Igor Burenkov said, as quoted by the newspaper. The first test flight of the Angara-A5B is scheduled for 2023, while the rocket's first unmanned flight is slated for 2024, according to the media outlet. The Vostochny Space Center is under construction in the Amur Region of Russia's Far East since 2012. 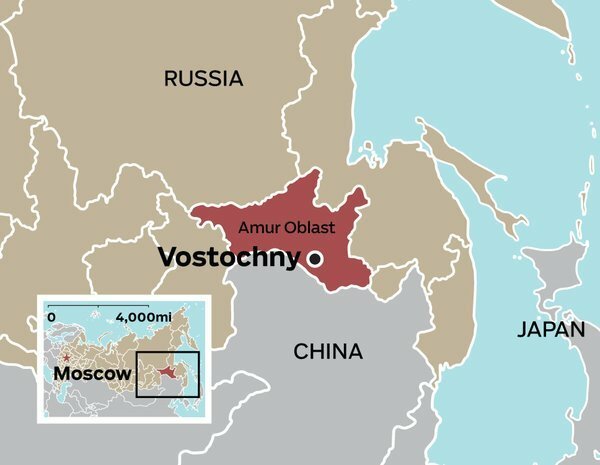 Vostochny will enable Russia to launch most missions from its own soil, reducing the country's reliance on the Baikonur space station in Kazakhstan. Earlier statements claimed that the first launch of a new manned spacecraft on an Angara heavy rocket carrier would take place in 2023. 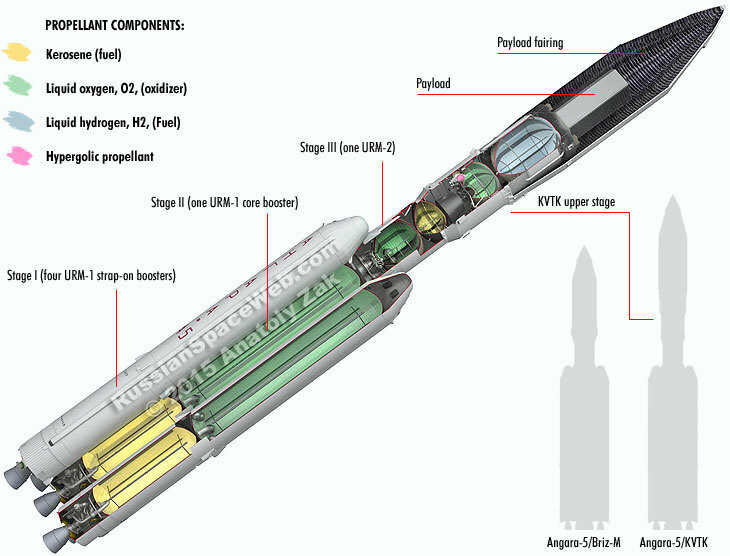 The Angara family of space launch vehicles has been in development since 1995. In April, Roscosmos head Igor Komarov said that Russia could use the modernized Angara-5 heavy-class carrier rocket in a moon exploration program in 2025 and a manned moon landing in 2029. Russia's moon landing project among other space programs will face further budget cuts and even risk of closure following the government's austerity measures, a senior official of Russia's space industry said Monday. "We don't rule out that further space budget cuts would continue in the upcoming years," said Yuri Koptev, head of the scientific-technical Council of Roscosmos, the governing organ of Russia's space industry. Russia's moon landing plan requires at least 2.4 trillion rubles (34 billion U.S. dollars) until 2025, according to Koptev. Roscosmos head Igor Komarov said in April that Roscosmos would keep implementing space exploration projects despite the economic difficulties and try to help Russian cosmonauts land on the moon no later than 2030. Russia's space strategy charted by Roscosmos until 2030 regards the moon missions as a step toward a manned flight to Mars. The reform of Russia's space industry became imperative following a recent string of launch failures, and many enterprises in the industry are in bad need of financial optimization and state support to pay off their multi-billion debts. Russian Deputy Prime Minister Dmitry Rogozin in May criticized the country's space industry for ineffective management and excessive capacity, calling for urgent reform and tougher punishment for mission failures.